Zeroed the trip odometer to commemorate the start of the Atlantic ICW at mile marker 988. For the coming months, Andiamo will be heading north and this was the first full day of being in the waters of Atlantic Ocean, a boating first for us and the tug. 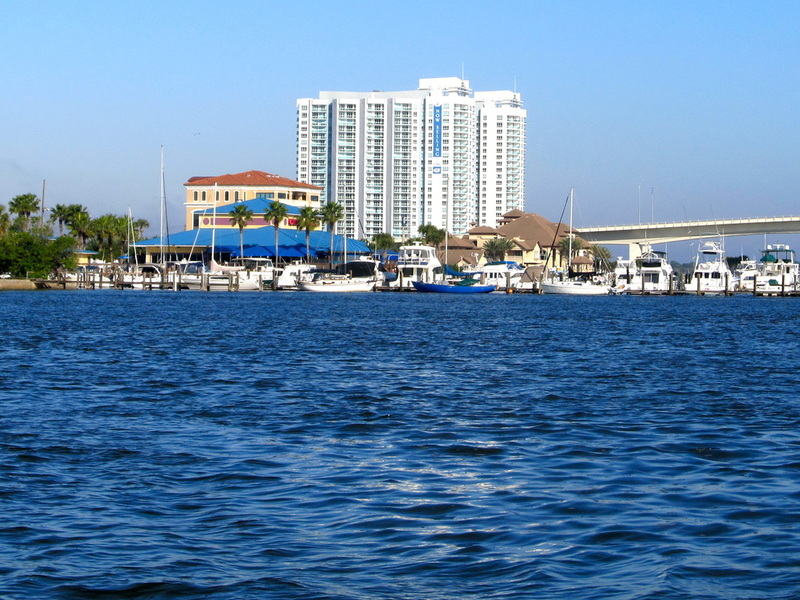 After a morning stroll to see the nice residences, the lines were dropped and Andiamo slid out of Manatee Pocket, transited what the locals call “The Crossroads” where the ocean, the Indian River and access to the St. Lucie River all intersects. 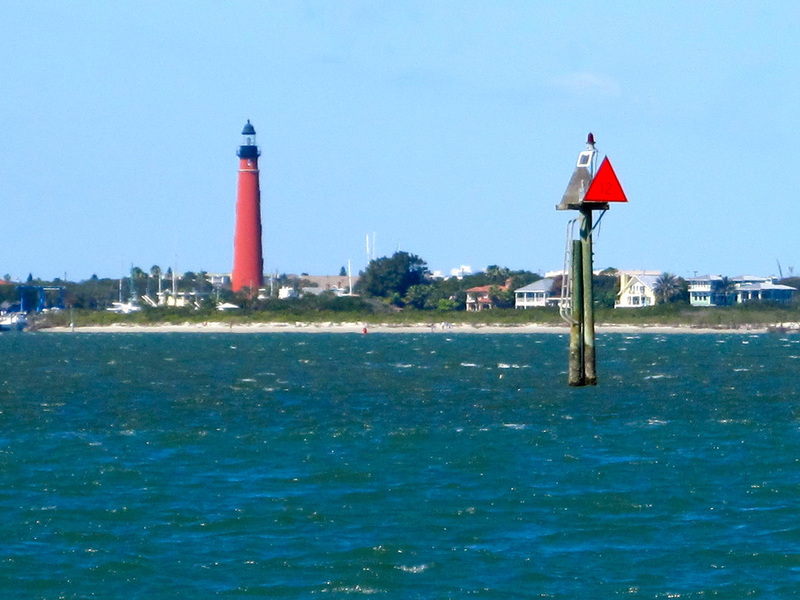 We headed north up the Indian River with the mainland on our port side and Hutchinson Island between the ocean and us. The fresh southeast wind provided a following a sea and a bit of a boost. For the next three hours, we cruised along at about 8 MPH as the wind built and the chop rose but nothing that we have not commonly encountered on Puget Sound. 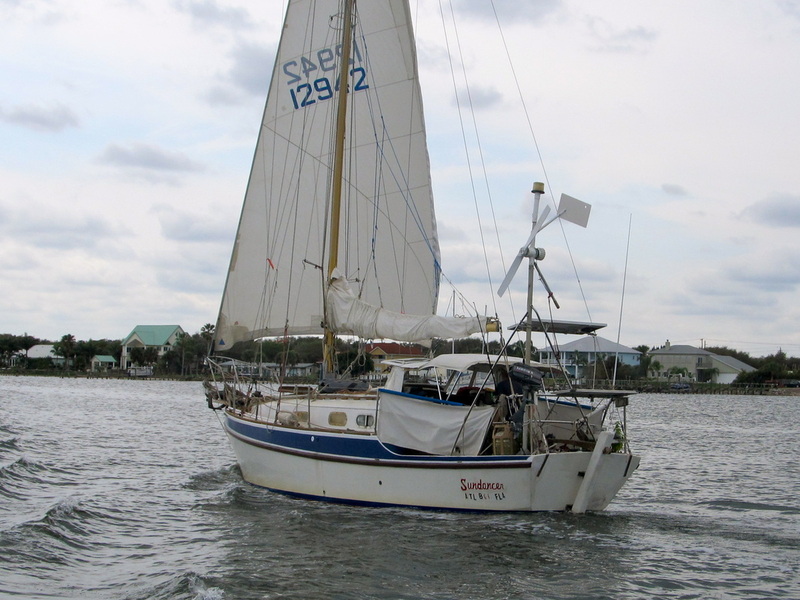 Andiamo slowly caught up and then passed a mid-30’s long sailboat that was a long-term cruiser. 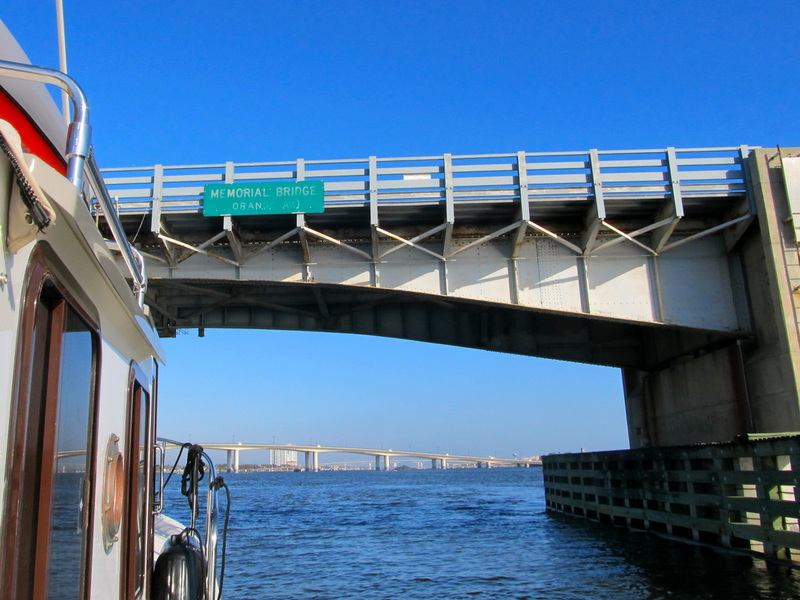 Like the St. Lucie River, the Indian River was wide but arrow straight and the navigable channel was sometimes narrow requiring constant attention and the autopilot was used only in short stretches. 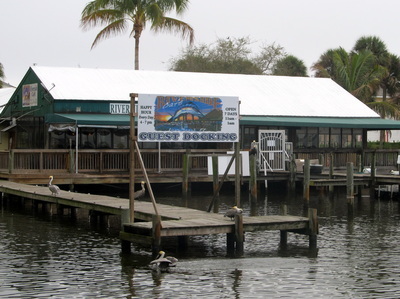 The destination was Fort Pierce and its municipal marina because another cold front was approaching from the north bringing wind, thunderstorms and some rain. Accessing the marina required going to the A1A Highway Bridge, making a tight left turn, following the channel markers and going south to the newly constructed breakwater. 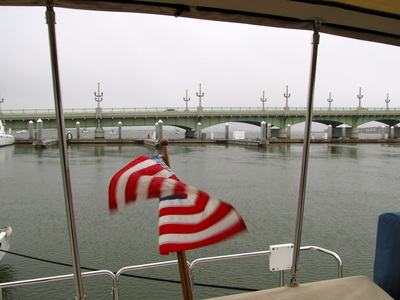 This was first phase of a waterfront-rebuilding project that is federally funded by FEMA. This $18M phase has resulted in new docks, walkways, streets, lighting, parks, and public buildings. The second phase will included an expanded marina, boat ramp, and amphitheater. 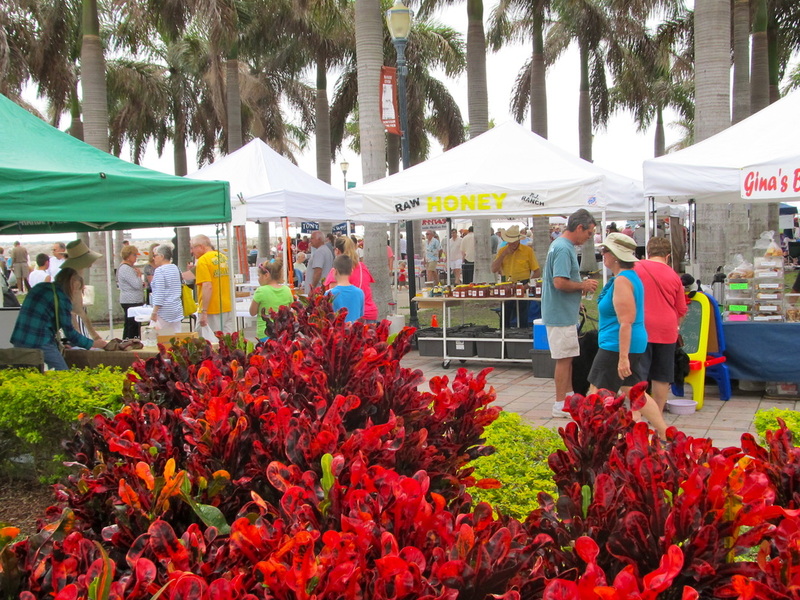 Fort Pierce was founded on the waterfront and it is doing its best to make it a central focus. Directed to E-Dock, we backed into the slip fighting the moderate breeze as it attacked the starboard side and tried to push Andiamo sideways. The assistance from the marina employee was great. At the marina office, we opted to stay another night and were re-assigned to another slip as a yacht club was coming on Friday for the weekend festivities happening in town. “What festivities?” asked Laurie with the sound of glee in her voice. 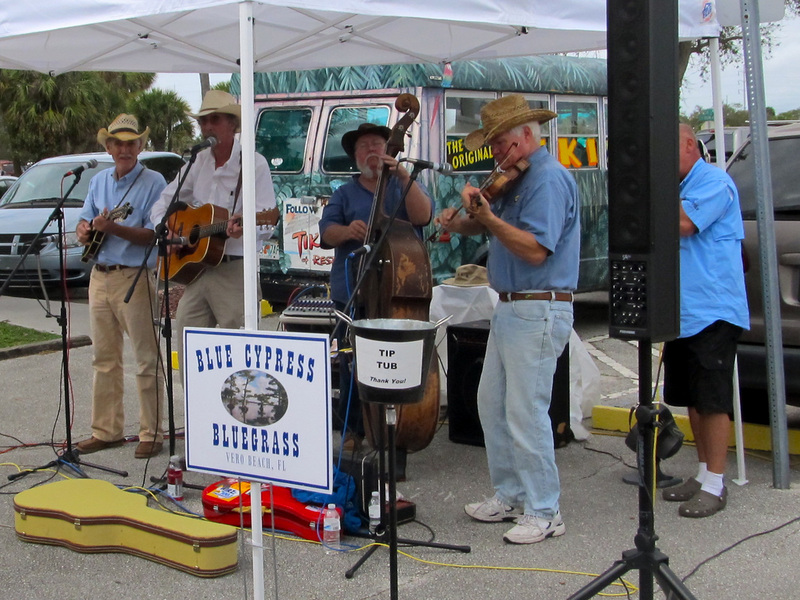 There was an Italian and a Greek celebration, plus the cowboy/horse race that started on the west coast was ending in Ft. Pierce on Saturday, a championship BBQ contest, plus the best ever Farmer’s Market. Our slip was reserved if we stayed longer. 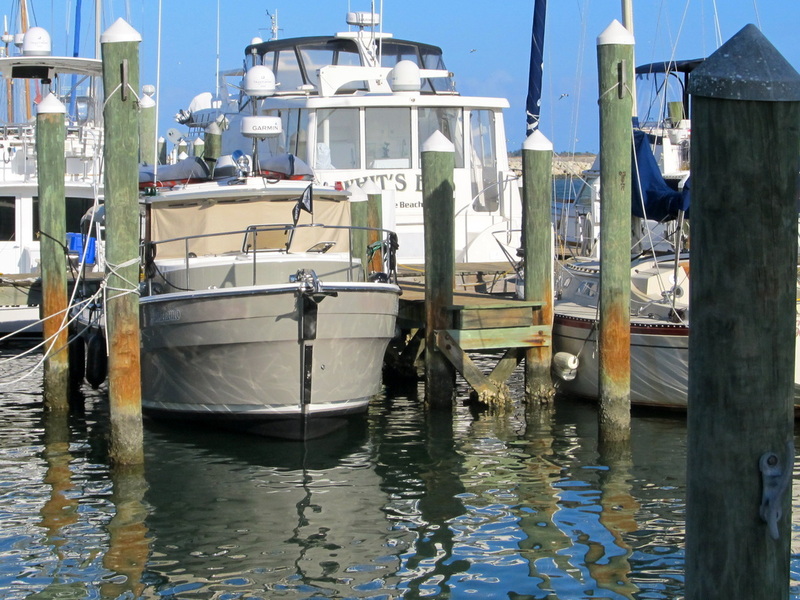 The harbormaster offered another space on the other side of the marina. So, we moved the tug and fought the wind again but no one was hurt, the boat was not damaged, and no hurt feelings, our definition of a successful docking. 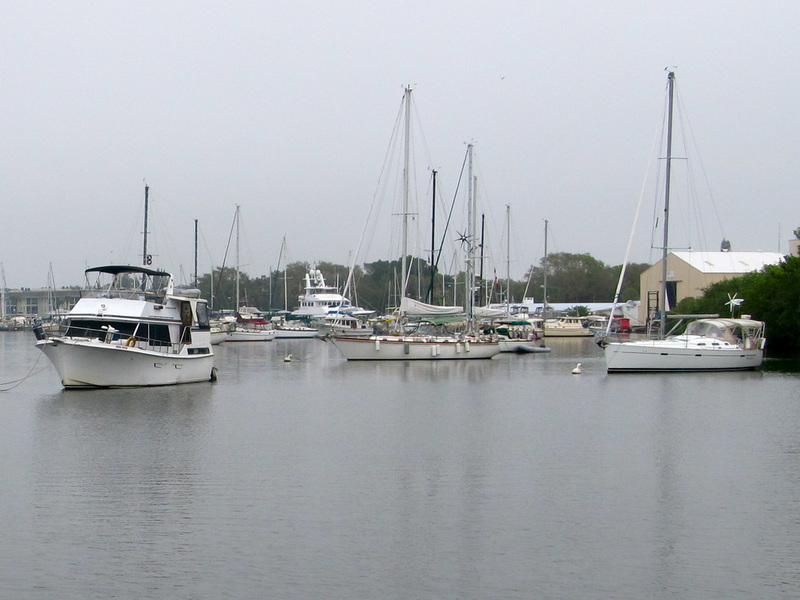 The north end of the marina is quieter with more liveaboards and no visitors walking the docks. 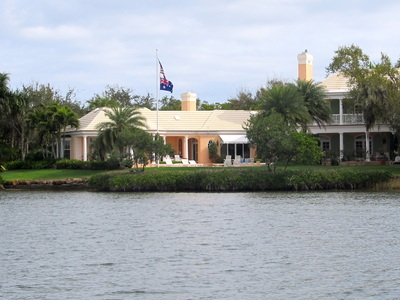 We would become chatty with a couple from New York who lived on their massive sundeck yacht, an English couple who had sold their sailboat and are leaving for the BVI in a couple of days, and a younger couple who lived aboard their yacht. The folding bikes were quickly put together and we explored the route to the Navy Seal Museum on Hutchinson Island and found the two-mile trip and crossing the bridge safe and do-able. The museum would be seen tomorrow. Found the walking path along the water and found another example of poor planning of sidewalks. Every planning director and city engineer should be required to get out of their office and actually walk or bike the project then this could be prevented. The bikes were great as we covered a lot of ground while being able to be up close and personal. 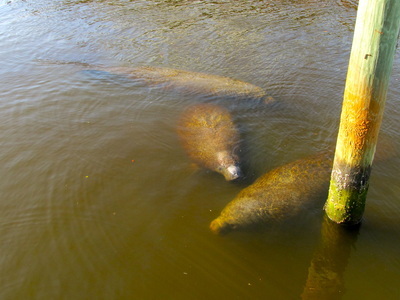 Next, to the Manatee Education Center, we watched 7 manatees lounge around. 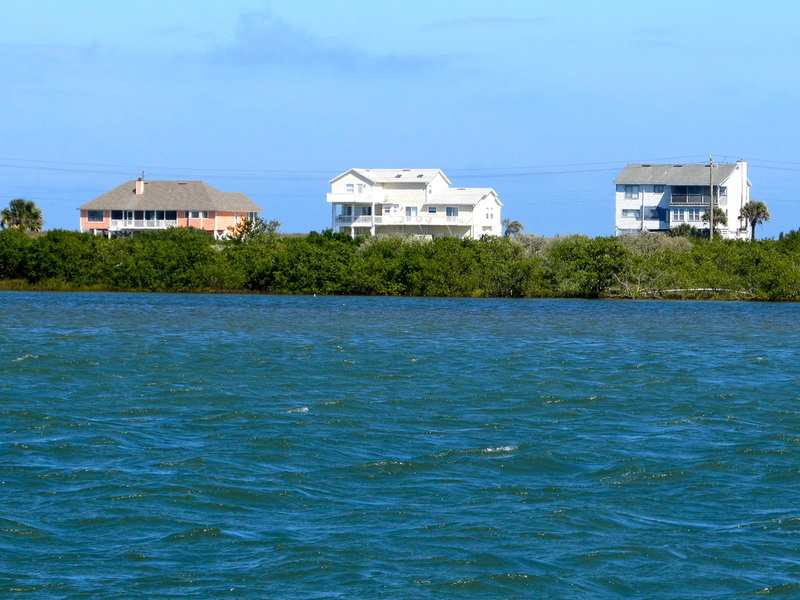 There, we learned that that Indian River estuary is really struggling with pollution from a variety of sources that includes Lake Okeechobee where chemicals are spread for a variety of reasons. The afternoon was closed with beer, showers and pork chops on the BBQ. 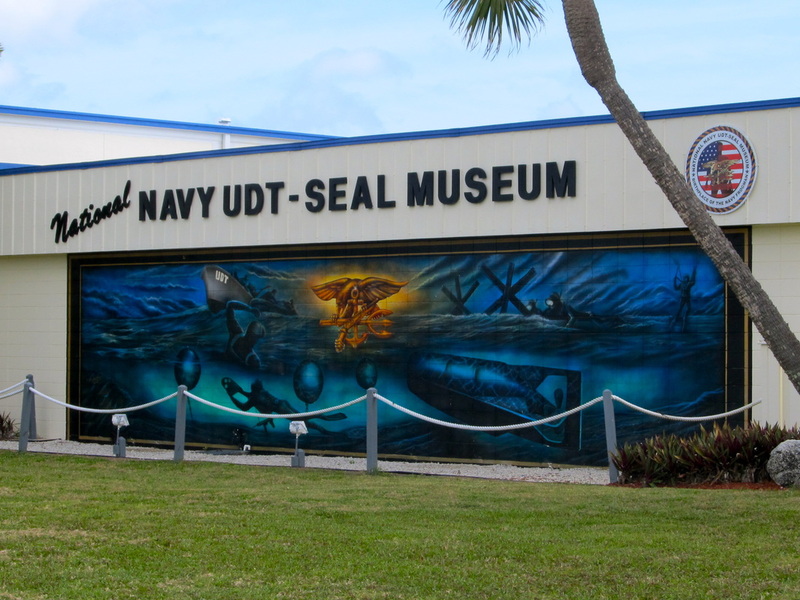 The next day, the bikes easily took us to the Navy Seals Museum on Hutchinson Island. The gates opened at 10 AM and with 15 minutes to wait, we walked the short distance to the Atlantic Ocean and took stock of our accomplishments, so far. The museum chronicles the story of the Navy Seals, their origins in World War II, being created by President Kennedy and sent to Viet Nam, their selection and training, their involvement in a long list combat theatres and their values & creed, was eye opening. On the way back, the sky was darkening and the wind was climbing with the predicted on-set of thunderstorms. When the first drops came down, the entrance to the Fort Pierce Inlet State Recreation Area called us until the park employee at the entrance station snappily stated, “It will cost you two dollars to get in with those bikes.” We wanted a short-term shelter, so we opted for a covered interpretive sign until the rain cell passed. 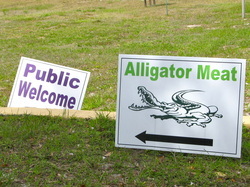 The sign championed the value of using the park for fitness. I am all for fully funded parks and that user-fees need to be part of a larger funding formula and especially when the activity is a drain on resources. As emperor, I would champion the value that activities that are good for people or for the environment would be free. 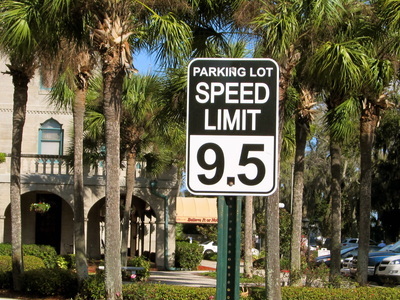 Come to a park by human-power and the entrance fee is waived, come by car and pay the full freight. Going to the dump should be free, littering or being forced to cleanup debris or garbage should be very expensive. Pump-out facilities should be free and commonplace, the ability to pump overboard should be banned and doing so would be expensive. 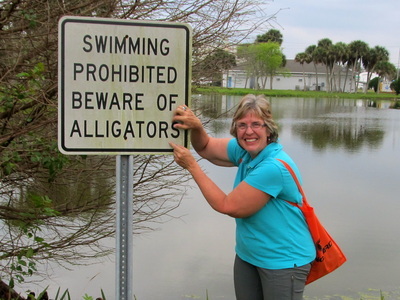 Florida does have certain things figured out. For example, helmets are not required for anyone. This is probably a boom to the much needed organ donor program and can reduce the number people on Social Security. Another example is the regulation of alcohol. Unlike Washington State, you can buy beer anywhere and drink it anywhere and at anytime. Getting hard drinks is easy and commonplace. Couple that with the non-helmet law and the organ donor program should be great. 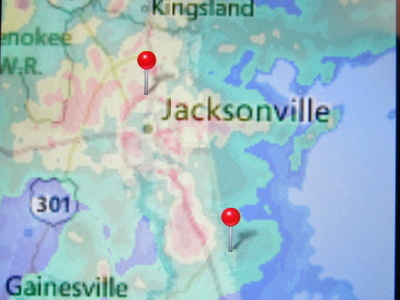 The rain cell passed in minutes and being low on calorie-fuel, a chicken wrap at Wendy’s with sweet tea hit the spot. Back at Andiamo, the bikes were stowed in their canvas bags and returned to the mid-cabin berth as the front was approaching. The app, Weatherbug, is our favorite because it has hourly and 10 day forecasts, radar, and alerts. 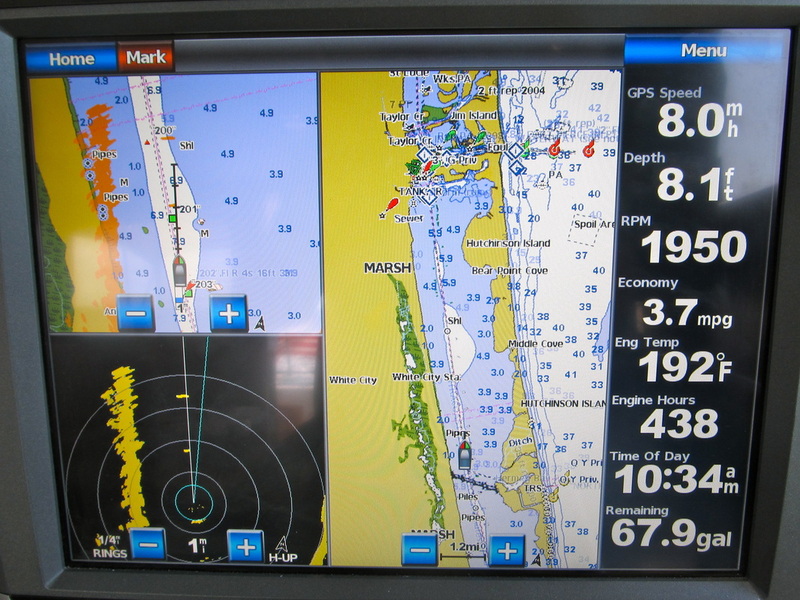 When used together with the app, Sailflow, that is the very best for wind conditions, present and predicted, you have a much deep profile of the weather and boating conditions. A planning session for the next week was done using the weather apps, paper charts, Waterway Guides, and the website, Active Captain.com. 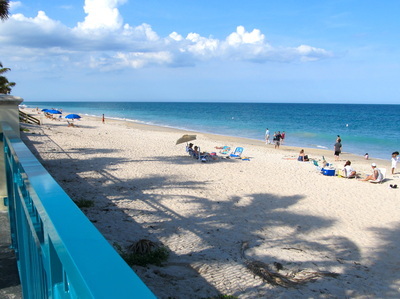 Afternoon thunderstorms are forecasted for the next few days, so the next stop will be Vero Beach for two days. Feeling the need for some anchorages, options were considered for the trip north through Titusville and Daytona Beach. As predicted, the skies opened up around 6 PM and it poured for 30 minutes. The following hour we were entertained with cloud-to-cloud lightning. After the dinner of shrimp salad and wine, we walked to the Sunrise Theatre for a sold-out performance of Man from LaMancha. The audience was 99% white, 80% over 65 years old, and 90% were attired in those expensive clothes that are intended to look casual but are not. The dialect was New York, New Jersey and New England with a smattering of Midwest. Is the following a regional custom, the demographics, or just a fluke? As a prelude to the performance, two classical guitarists sat on the stage and a dancer performed for 10 minutes. Half of the audience became quiet and paid attention while the other half continued their talking, joking and visiting. The first half’s experience was noticeably degraded by the second half’s behavior. It was baffling. 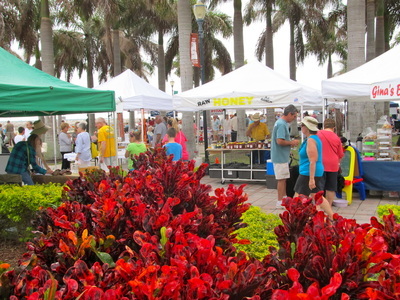 Saturday was event day that started with their renowned Farmer’s Market. All of the banners hanging from the light poles proclaim this market and it did not disappoint, though not one farmer was there. Over half of the market was arts and crafts. There was some fresh produce and the rest was food vendors. The music was good, the sky was partly cloudy with a cool breeze, and the place was packed. Leaving the market, a long parade of horses and riders came into the marina area. 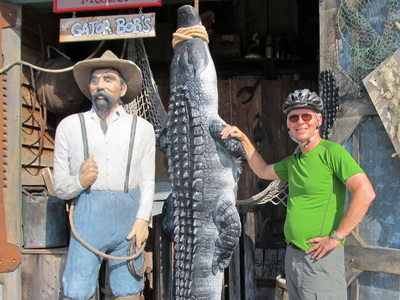 This was the conclusion of the annual Florida Cracker’s Ride that started 110 miles away on the west coast. 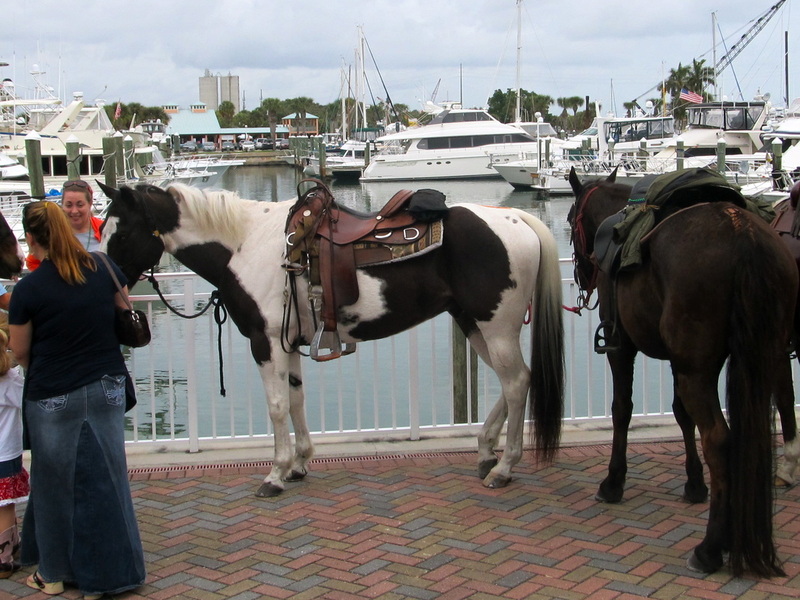 Horses mixed with boats, cowboys mixed with tourists, rock music was at one end of the marina and bluegrass was at the other end. We shared a can of Florida Cracker beer as sign of support. The term “Cracker” illustrates the differences in Florida’s culture. To the multigenerational natives, this is a term of pride whose roots go back to the Spanish and the European cowboys and their deep roots to ranching. To others, it is a derogatory term that closely means redneck with overtones of racism. 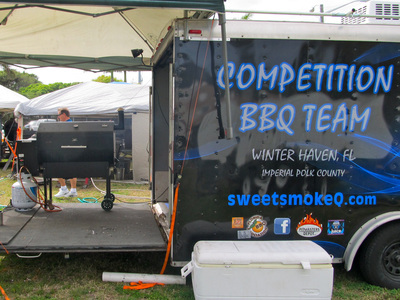 Lunch was at the BBQ Championship that was being held in a nearly park. There were vendors selling their product and, separately, there were teams seriously engaged in making their products. We stopped a tournament official who explained that the teams had to make ribs, brisket, chicken, and pulled pork and deliver it to the 6 teams of judges at specific times. Their product was judged for appearance, tenderness and taste. 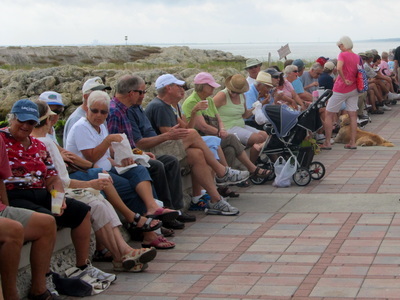 The official was asked for his recommendation on which vendor to buy our lunch from and the recommendation was “2 Crackers.” We took their ribs, brisket and “Dad’s Sauce” to the beach and sat on a rock and enjoyed great BBQ. Whether it was the best there is not the point. The serendipity was getting a recommendation from a knowledgeable local and we enjoyed it. 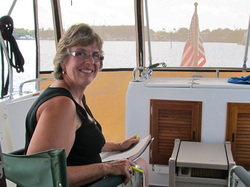 Laurie, as the, “Vessel Intelligence Officer” or VIO spent some time with a veteran cruiser of the Carolinas and marked up her new chart with ideas. Dinner was at the Italian Festival where their booths and entertainment replaced those from the Farmer’s Market. 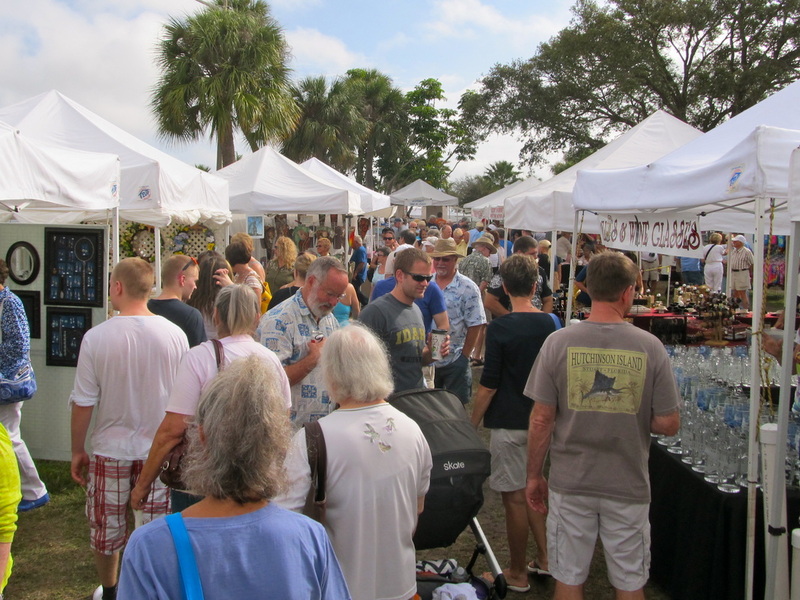 The brief thunderstorms had thinned out the crowds leaving no lines at the food vendors and an intimate feel with the entertainers. The evening skies cleared up revealing the stars and it was closed with watching a movie on the tug’s entertainment system. 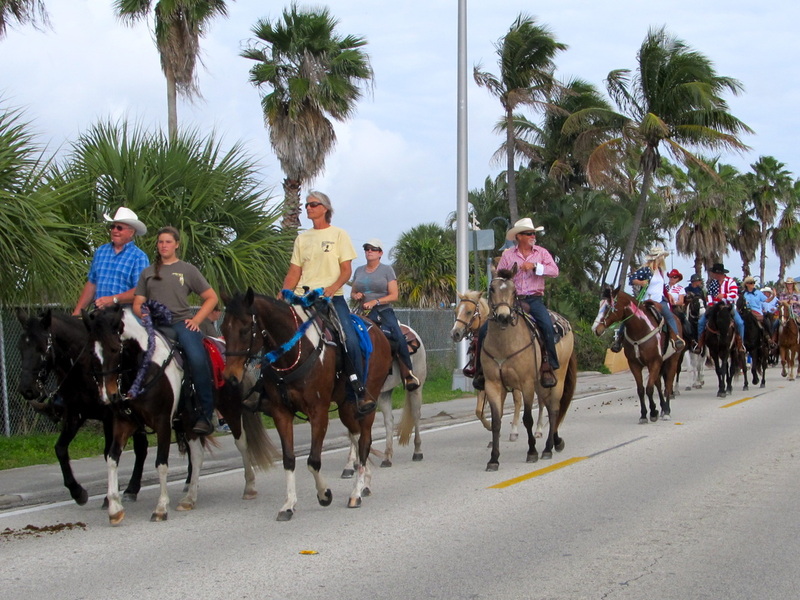 With no hurry to leave Fort Pierce, the marina and adjacent areas were walked. 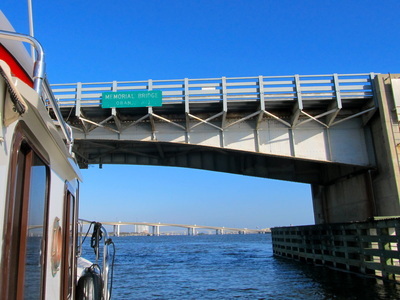 With the sun at mid-morning, Andiamo was un-tethered, the marina key and power splitter was put in a surplus letterbox with its one-way deposit and we idled out and headed north on the ICW. 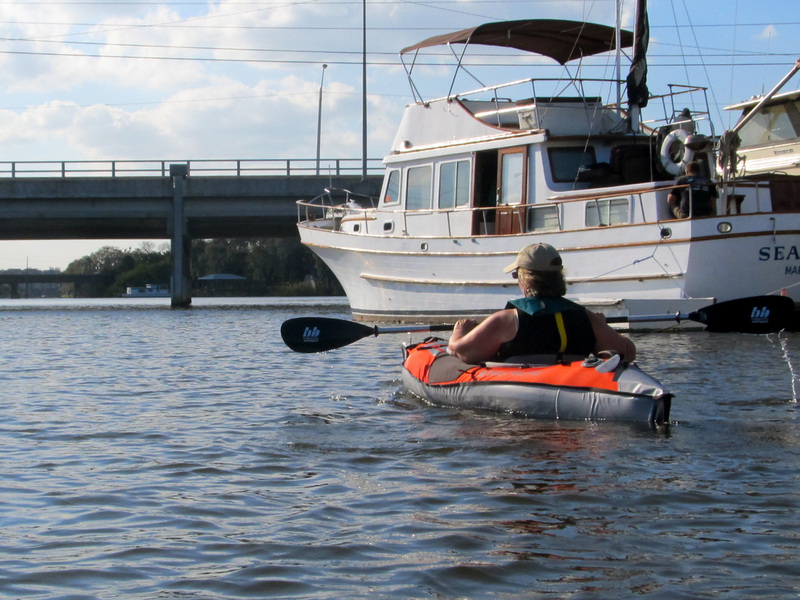 The destination was Vero Beach, about 10 miles away and it was a two-hour trip because of the Manatee speed zones and the weekend-caused increased boat traffic. 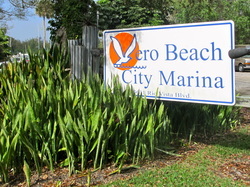 We were glad to have a reservation at the Vero Beach Municipal Marina because we took the last slip. As we idled into the 40-foot long slip, all the neighbors who live aboard their boats lined the dock to help us, made introductions and welcomed us. This was a friendly group. The stay would be for two days as the afternoon thundershowers were new to us and Daytona Beach to the north had gusts of 50 mile an hour winds. We were playing it conservative and were not apologetic about it. 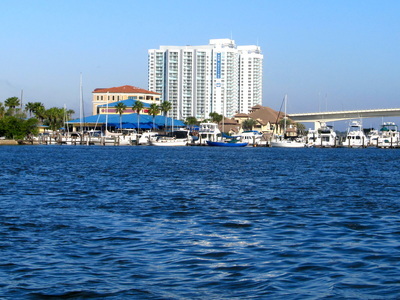 The marina is on the island side of the massive bridge that makes a connection to the mainland. 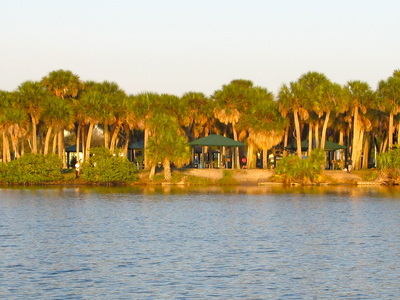 It is not new but not neglected, tucked up a lagoon, next to the yacht club and a sprawling city park that has an art museum, performing arts center and ample walking trails. 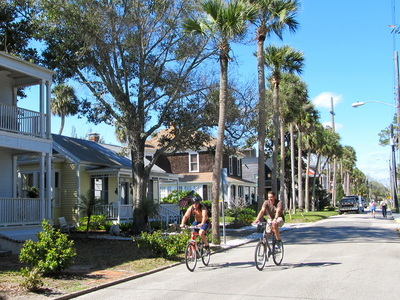 After the back-to-back conversations with the neighbors and a light lunch, the bikes were set up and the afternoon was spent exploring this pseudo-island community that has a unique vibe of being friendly, up scale but not snobby, a mix of neighborhoods there were “old Florida” and resorts on the beach front. 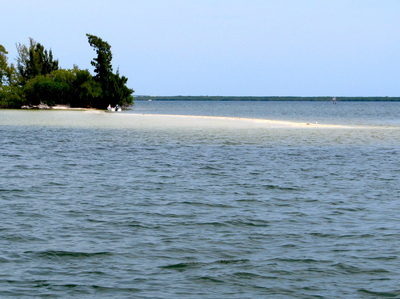 The boaters call this “Velcro Beach” because so many of them find a home here and it is easy to see why. With a population of 43,000, this is not a metro area; it is on edge between the very hot part of southern Florida and the colder northern portion. The city has a great infrastructure and a vibrant culture. The marina is constantly trying to find the balance between the demand for monthly and weekly moorage and the opportunity for the day-to-day transient moorage. 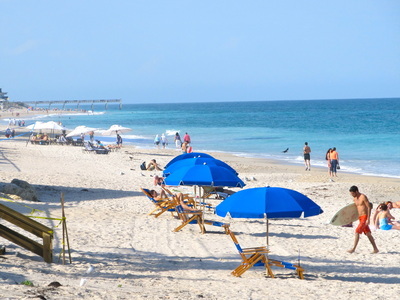 After biking to the south beach park and locking up the bikes, we walked the sandy beach of this part of the Atlantic Ocean where teenage boys were trying to impress the girls with their skim-boarding skills, sand castles were under construction, and skin cancer research was in full swing. The bikes took us through the retail district, the new housing development where homes would start at $2.4 million, older neighborhoods with trees forming a canopy across the whole street, and back to the marina. The bikes were put away as the Weatherbug app said that a thunderstorm was coming with an 80% chance of rain and it was just after dinner, when the wind suddenly built up, changed direction to the west, and then it rained hard for 30 minutes. The morning brought clouds and fog with a visibility of ¼ mile and the air temperature was in the low 70’s. We opted to walk to the municipal park and found the bikes would have been better because we underestimated the distance to the park and its size. 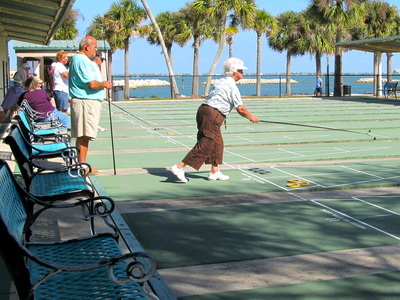 The park was ringed with walking and bike trails to the art museum and the performing arts center. The center was open grass field that was suitable for a circus. Small boat projects and inventorying supplies finished the morning and after lunch we took the free bus with standing room only the two miles to a large shopping complex for re-provisioning. While waiting for the return bus, Laurie found gelato, and I had a nice conversation with long-time cruisers who anchored their 42-foot sailboat in the lagoon near us. 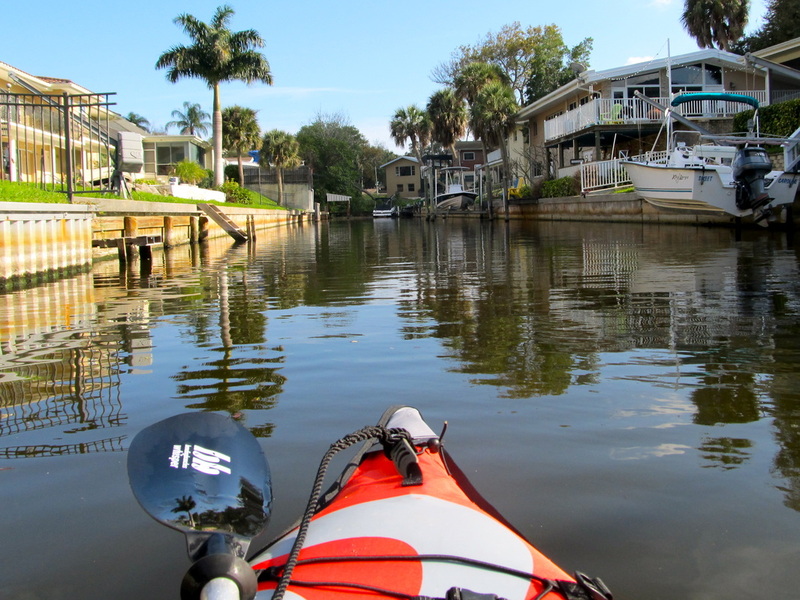 After the food was stowed, a kayak was off loaded off Andiamo’s top and the lagoon was explored while Laurie continued the on-going conversations with the neighbors. She was gleaning information about where to anchor and where to explore. This is an essential part of the mental preparation for the route in weeks to come because this results in us keeping in our comfort zones. 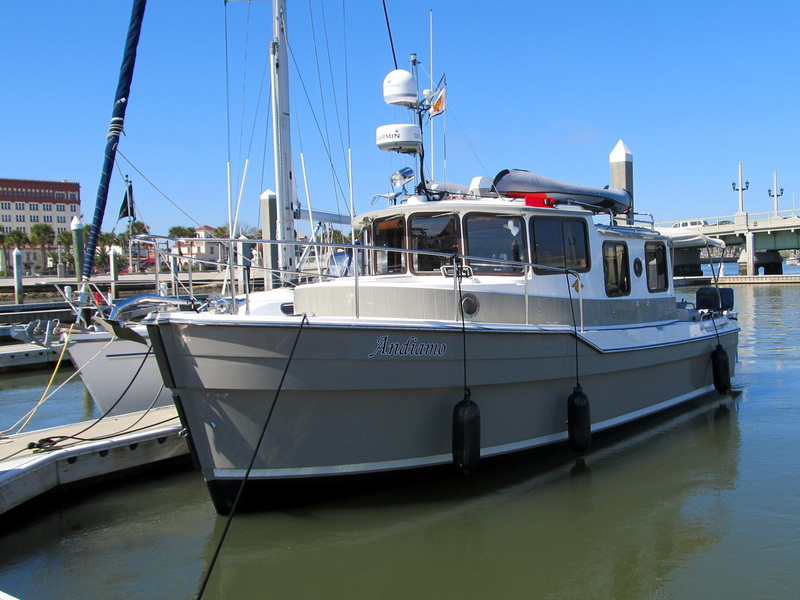 One of these conversations was with the owners of a Nordhavn 43, a great round-the-world boat that is well made and with an accompanying price point. 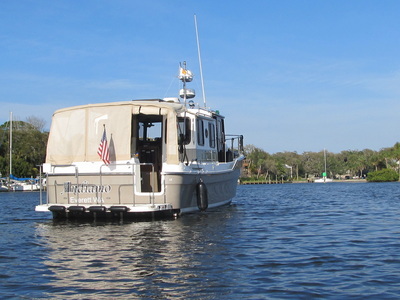 After owning their boat for 9 years and taking it everywhere they wanted, up and down the coast, throughout New England and into Canada, they had settled into Vero Beach and would buy a smaller boat. Though they loved their Nordhavn, the size had prevented them from going to great places. 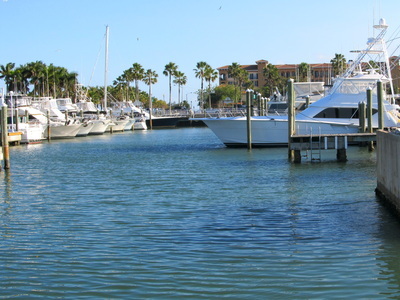 At the end of the dock was a 110-foot, custom yacht that was occupied. The owner and his wife are live aboards, there is the full-time deck hand and the daughter whose appearance was more off the pages of a New York fashion magazine. The yacht was annoying with the generator and both engines running for no apparent reason and then there was the repair job on those massive air horns and the testing that followed. No matter how big and expensive the boat is, there is some equality. We watched food lugged in bags and repairs being made. 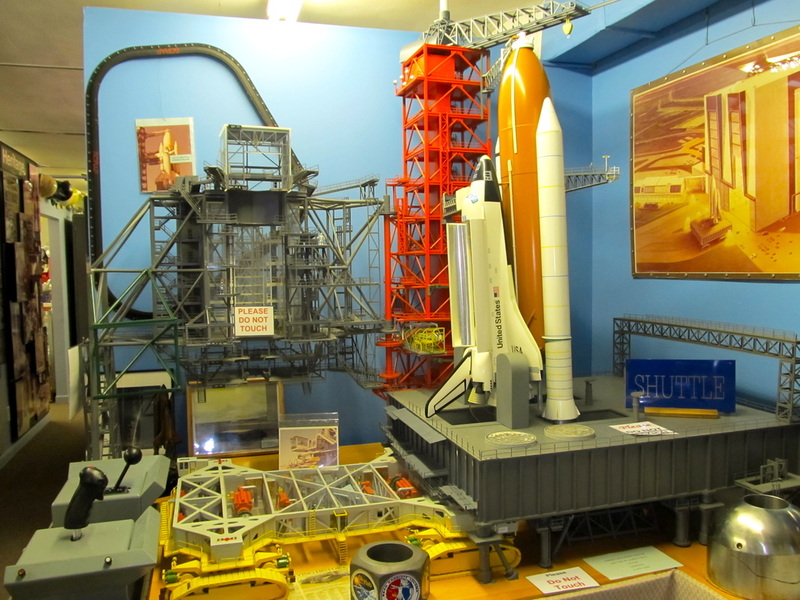 It is just a matter of scale. The owner, a big burly man in that ageless chapter between 50 and 70, stopped by Andiamo and pronounced that his boat was ready. Where are you going? Nowhere, but the boat was ready. We missed the broadcast of the season finale of Downton Abbey on PBS because there was no reception. So, we watched it on-line the following day with chocolate pudding and key lime yogurt and that closed the evening. The morning was nearly dewless and after breakfast we walked over to the fuel dock to determine where the pump-out facilities were. 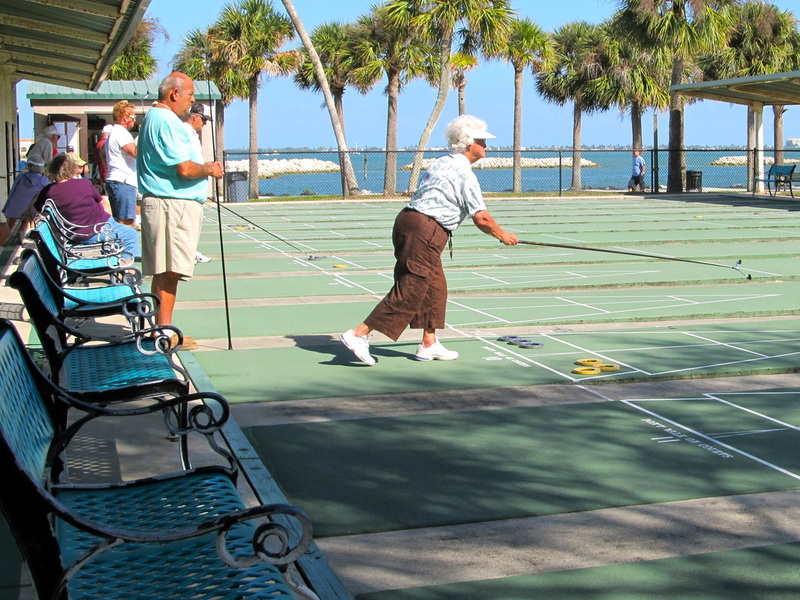 The employee was new to us, he retired from the Coast Guard, works three days a week, lives is a retirement community on the mainland, and takes pride in keeping the marina neat and clean when he works. After saying our good-byes to our neighbors, we idled over to the fuel dock and re-set Andiamo’s systems, meaning the hold tank (sewage system) was empty, the water tank was full, and the food provisioning and laundry was done yesterday. 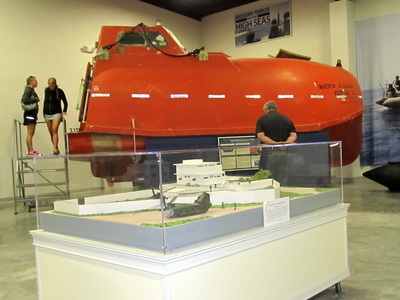 The tug’s engine and its roof-mounted solar panel generate all the power we would need for at least two days and we could easily travel nearly a 100 more miles on the diesel fuel left in the tank. Andiamo could be self-sufficient for at least a week. 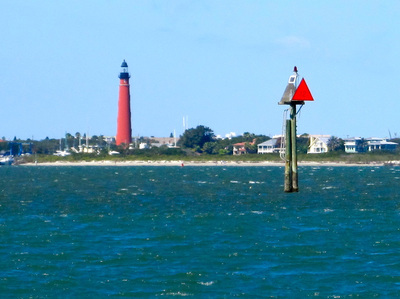 The destination was a set of anchoring options that began 10 miles away near Sebastian and continued northward. We were a bit tired of marinas and the “Captain Cheap” in me want to be more economical. Andiamo cruised at her slow and efficient speed. The long and straight Indian River necked down and twisted at John’s Island. On the port side were islands covered in natural vegetation. 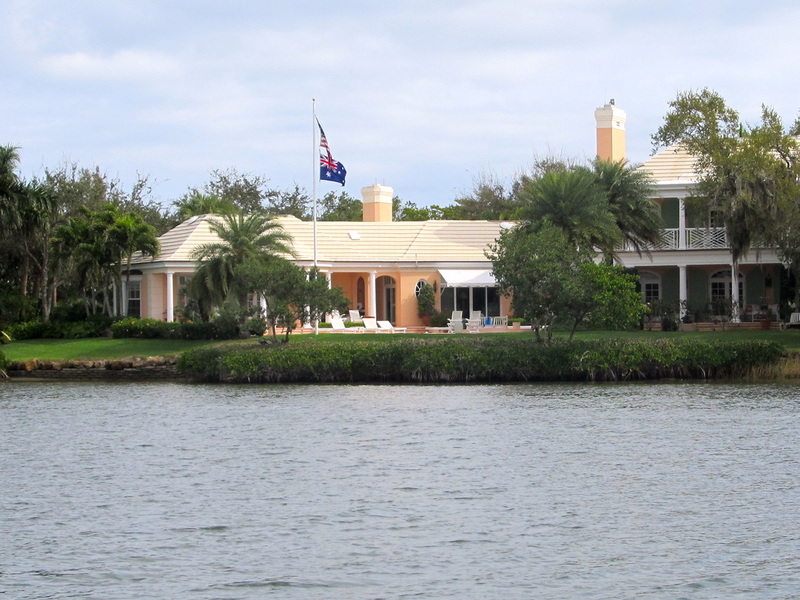 On the starboard side, were very, very high-end estates of the rich, powerful or famous. 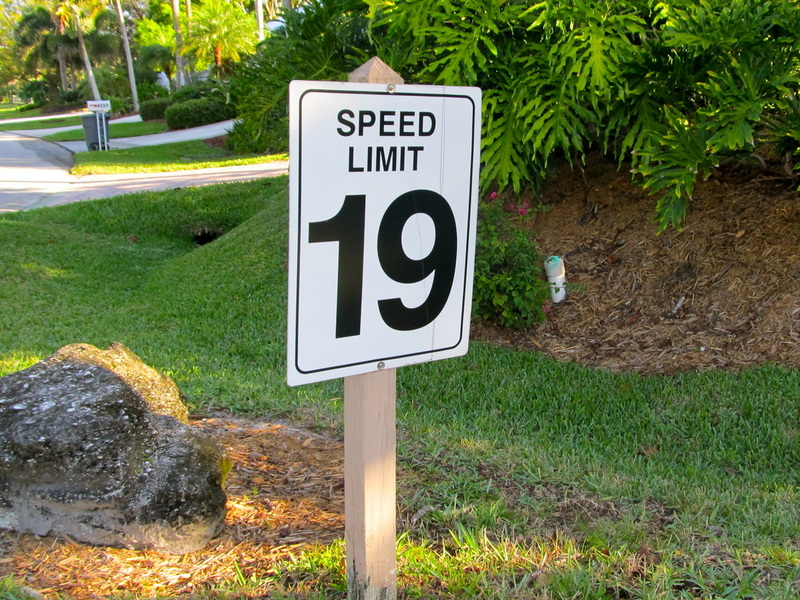 The odd part was the lack of a low speed zone as the channel was 30 MPH. Manatees were only recognized and protected outside of the channel. 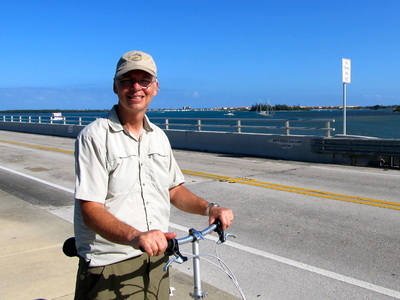 The ride was pleasant and comfortable as the 5 to 9 MPH wind was coming from the north and was dead-on the bow, the chop was minimal, and the current was taking us to the Sebastian Inlet. 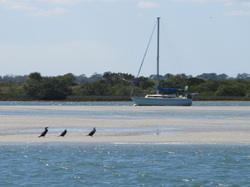 With the minimal boat traffic, more wildlife was seen: a manatee of the port bow, ospreys in very stages of nest construction on anything that was high and vertical, and dolphins feeding on the algae-sucking schools of mullets. Near out first anchoring option, the first large cruising sailboat that was actually sailing came at us and we both tipped our hats in respect to the old, weathered sailor at the helm. Three anchorages were looked at and rejected mainly because it was early in the day, the traveling was so nice and the places were not special. 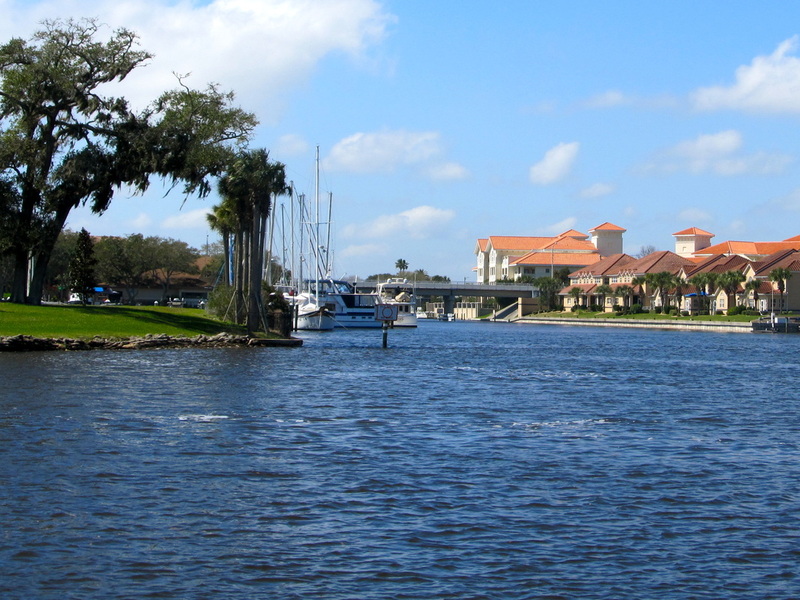 In Melbourne, we intended to look at four viable options and immediately took the second one, a quiet location up the Eau Gallie River, that was completely protected from wakes and wind in all directions. The narratives in Active Captain.com and the Waterway Guide were clear where to go and where to avoid. 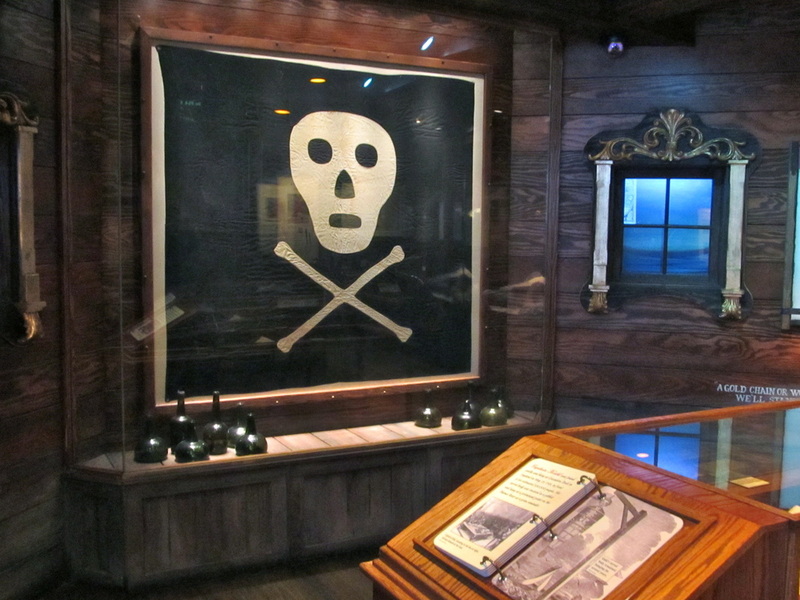 The anchor was dropped and easily set in the middle of the channel, in 6 feet of water, with 2.5 feet under the tug’s keel. The tug had taken us 48 miles. After a light lunch, decisions were made to enjoy Titusville and the Kennedy Space Center. No rockets were being launched during our time and though we are not space-buffs, it was an opportunity not to pass up. The kayaks were off-loaded, set up, and easily entered from the swim step. An hour was spent exploring the shallow bay, a canal, the small marina operations and watching the pelicans recklessly dive for their meal. Canvas side curtains in the cockpit created a cool and shady outdoor space for wine and crackers. The breeze was light and cooling and the temperature was in the low 80’s. Laurie did a first for dinner by baking cornbread in the oven and those were served with her homemade raspberry jam. The main course was a curry shrimp stir fry and it was great. 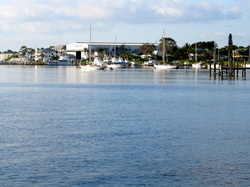 A quiet and peaceful morning in Melbourne, still water and not a breath of wind capped a wonderful anchorage. 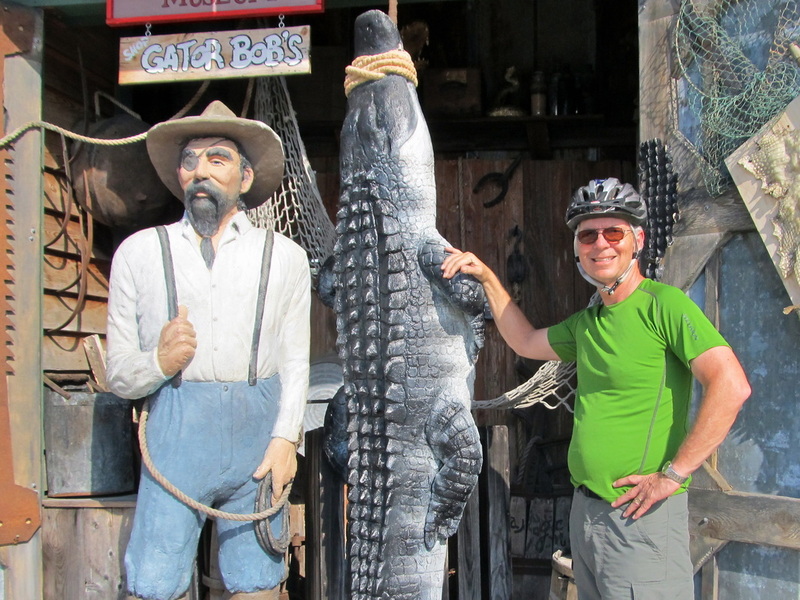 We idled out of the Eau Gallie River, past the old men with their fishing poles and 5 gallon buckets. The destination was 36 miles north to Titusville and its municipal marina as a cold front with wind and rain was predicted on the Sailflow app for the late afternoon. 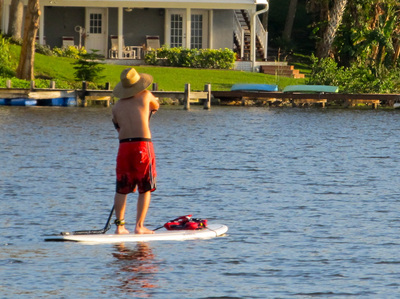 The Indian River was broad and the water was as smooth as a baby’s bottom as Andiamo made the only wake at 8 MPH. The 4-½ hour cruise was easy and nearly restful. Nearly everyday crabpots are seen on the edges of the channel and sometimes they are dodged. 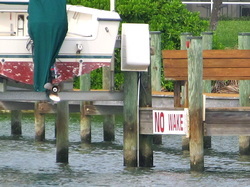 Unlike Washington State, these crabpots are not distinctively marked and vigilance is required to not run one down with the risk of fouling a line in the prop. These pots have been a mystery, as a crab boat has never been seen setting them or pulling them up, until today. 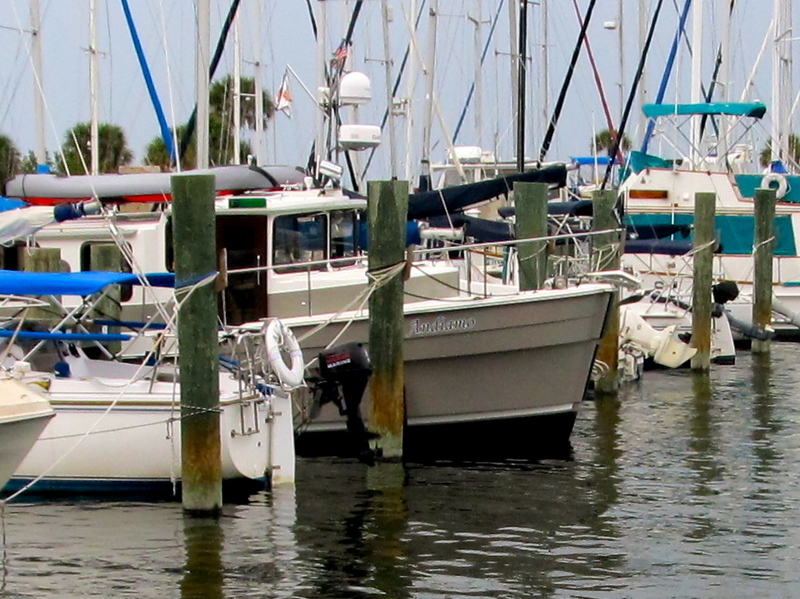 The wind was rising to a gentle breeze when Titusville’s large marina was entered shortly after 1 PM. The larger mooring field of city-provided buoys to hook onto was considered but the distance to the shore was too far for kayaks but more importantly the weather was predicted to have a punch. 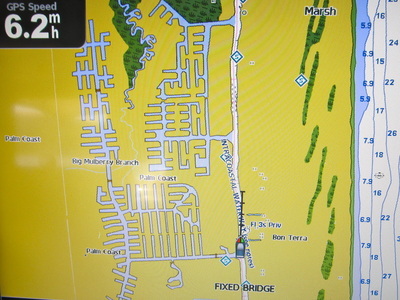 The pleasant voice of Sue who has worked the office for years was clear and her directions to the slip were excellent. Andiamo was backed into the 30 foot long fixed dock, between resident sailboats when the dock hand came cycling down the dock to help us. Clearly, he was not used to having self-sufficient boaters as the lines were handled and adjusted. Within the hour, we were walking the short distance into town as the skies were darkening and the wind was rising. 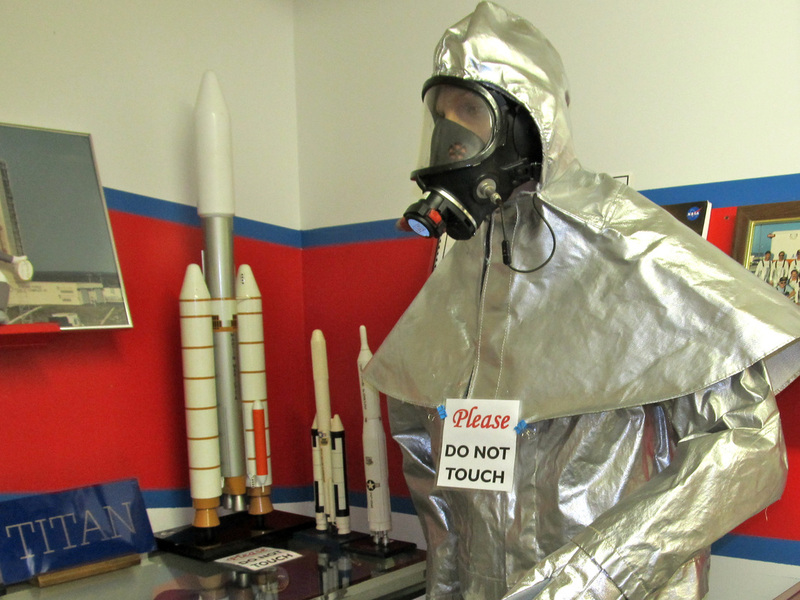 In 90 minutes, the Free Space Museum with its eclectic collection of memorabilia and found space equipment was found and explored. The museum was a 6-room store front on a quiet street. We had an orientation provided by Glenn who delivered the information with enthusiasm. Then, iced coffee and dark chocolate at the Café Chocolate was enjoyed when the weather grabbed our attention. With the rain starting, we fast walked toward the boat, got half way when the torrential downpour started and we found shelter in a city park's covered picnic area. Hats and good waterproof coats protected the upper half, but the pants and shoes were soaked through. 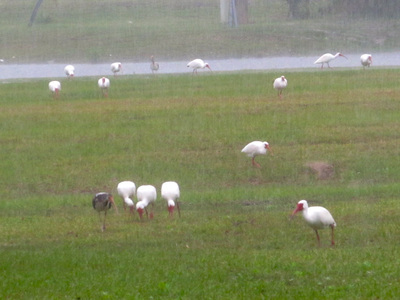 The birds in the park loved the rain and when it let up, a quick check on the Weatherbug app showed a momentary break until another dark colored cell was going to arrive. Back under Andiamo’s canvas, the wet clothes were hung up to drip and dry while the skies opened up again. We hunkered down to a simple dinner, Laurie watched TV and read and I streamed a movie from Netflix using the marina’s Wi-Fi. At 3AM, Laurie woke up to the howling wind as the stays on the neighboring sailboats were singing. For an hour, the easterly winds sent waves into the marina and Andiamo rose and fell, straining against the dock lines. Then, it eased and all was still. 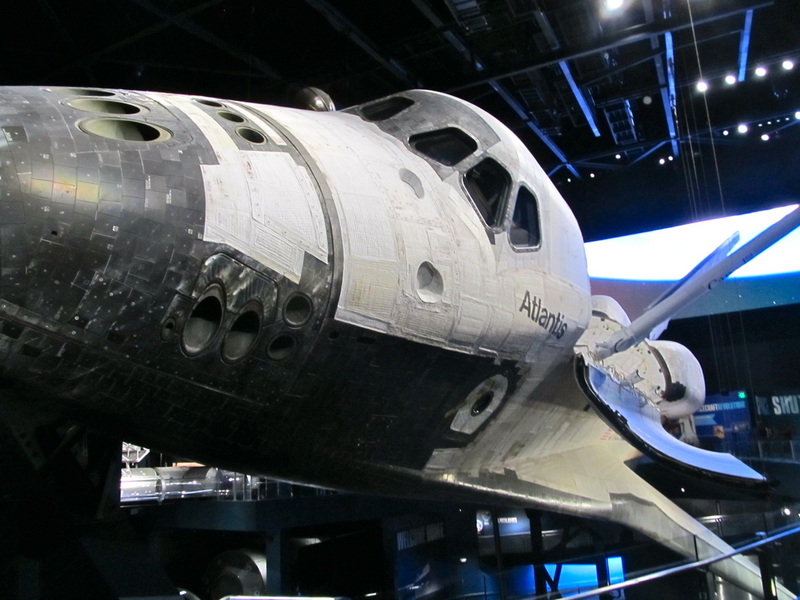 The next morning, the 58 degree temperature would be constant all day and under cloudy skies as the rain had blown through; a good day for a tour of the Kennedy Space Center. 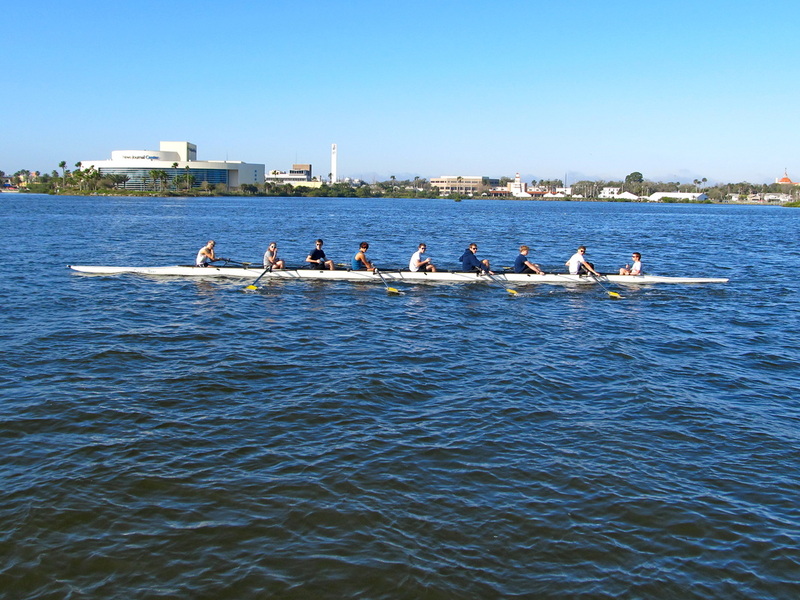 The marina’s shuttle made the 30-minute trip for a set fee, no matter how many riders. Another cruising couple was going to the local YMCA for a class. 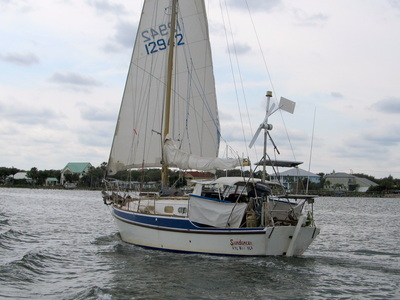 They lived on their sailboat, will go to Maine in July, and Titusville is as far south as they go. 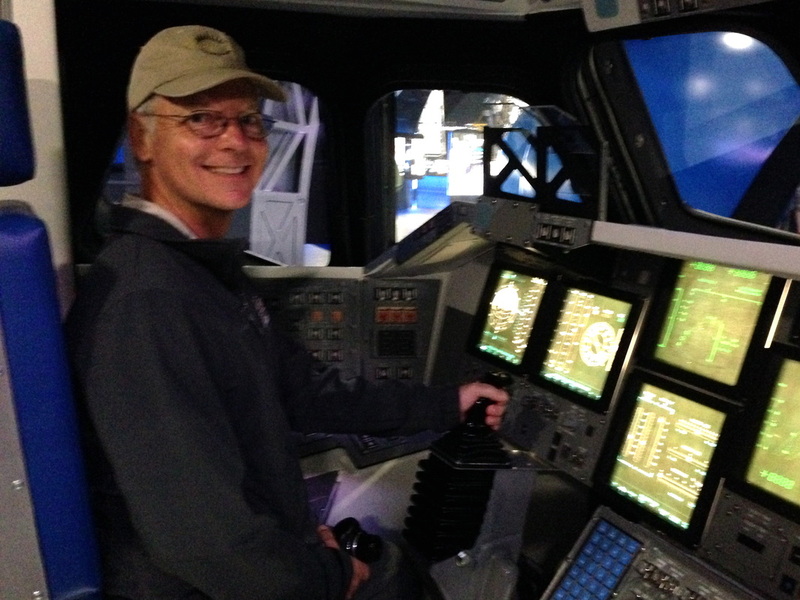 They provided the valuable tips on where to go and where to anchor in the coming weeks. Arriving just at the opening time, the huge parking lot was nearly empty day because it was off-season and mid-week. Florida has two busy seasons, October to December, and April to June. 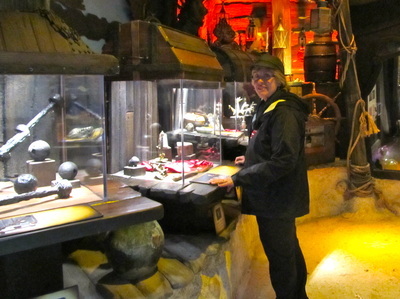 The visitor center, museum, exhibits and bus tour was totally enjoyed. 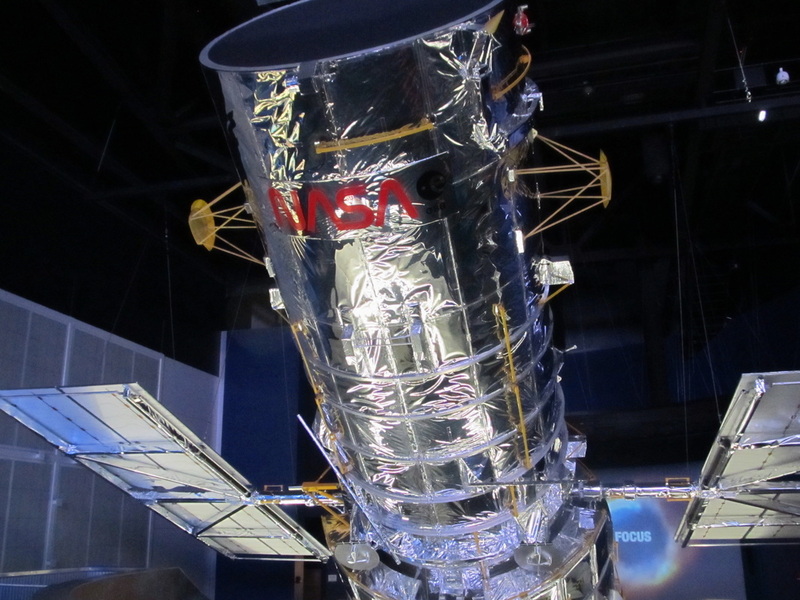 The IMAX movie of the Hubble Telescope blew our minds, the size of the rockets and the capsules was amazing, and we grew an appreciation and respect for the 400,000 people who made the space program and its incredible accomplishments a reality. 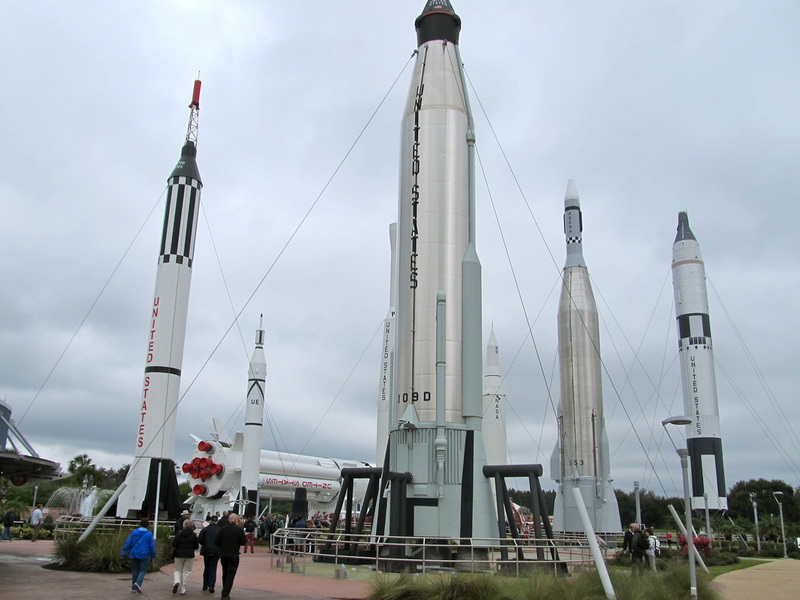 The bus tour of the assembly building, the massive trackers that moved the rockets to the launch pad and the pads themselves filled many gaps in our knowledge of this part of America’s past, present and future. The marina’s cruiser’s van picked us up on time as the park was closing and we arrived back at our floating home tired. A simple dinner, laundry because it was cheap, electronic communications, and watching Scandal on the TV finished the evening. 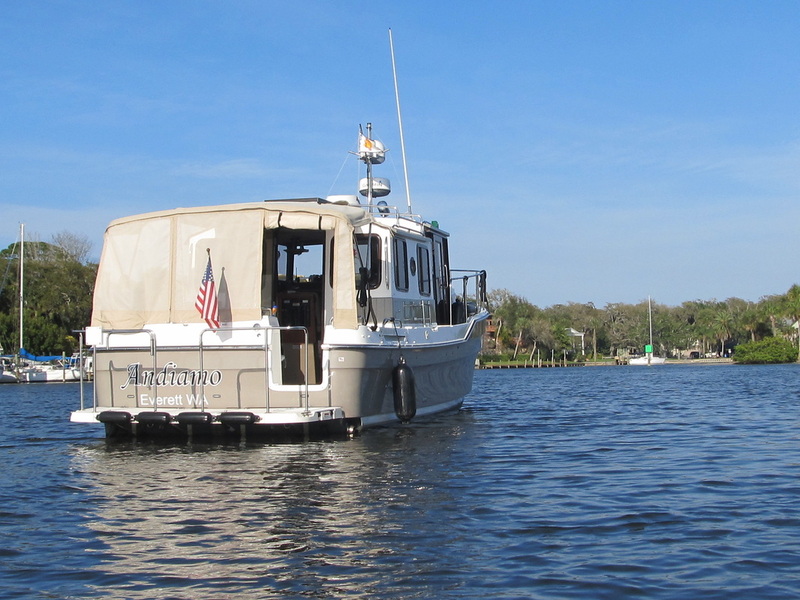 A trio of manatees nosed Andiamo’s hull as preparations were made for the day’s travels. They were attracted to the fresh water sheeting down the hull when the water tank was full. 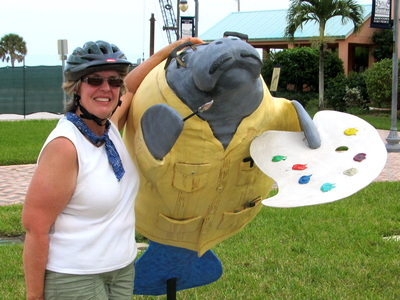 Every marina has a host of manatee-related signs and one of them says do not feed them fresh water, not because it is harmful, rather it encourages behavior that can harm them. Still, it was very entertaining to have Andiamo nuzzled, licked and coddled by these huge mammals. 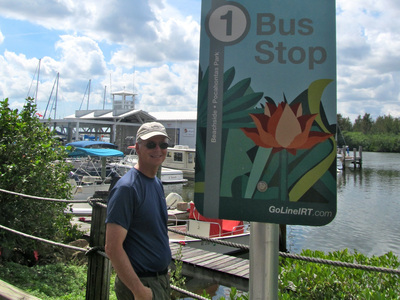 After leaving Titusville, the ICW continues on the Indian River between Merritt Island that is dominated by NASA’s Kennedy Space Center. We watched a couple of brown pelicans hover and follow a crab boat and it stopped, they would gently land nearby acting dignified and respectful while waiting for treats. 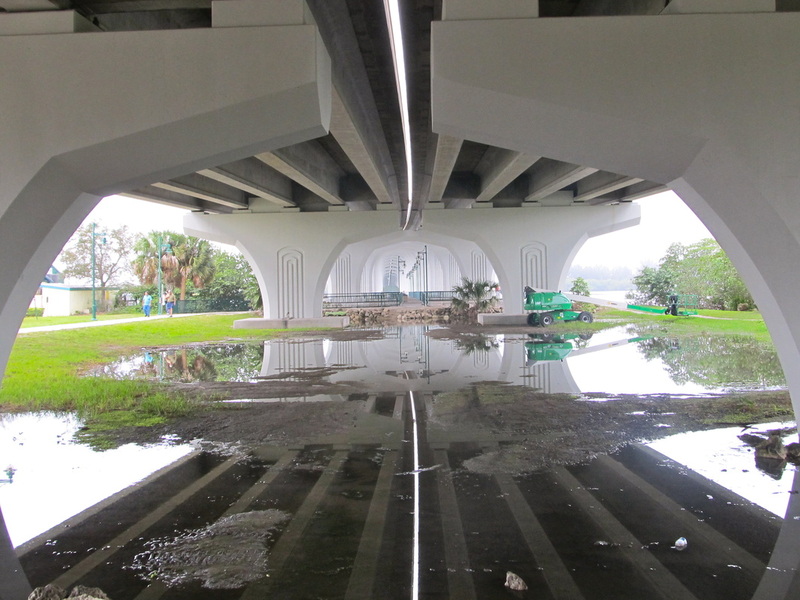 The mile-long Haulover Canal had been cut to join the Mosquito Lagoon to this portion of the Indian River and it is a haven for fisherman who line the shores of the canal under the trees that looked like pine or cypress. Laurie, the Chief Naturalist, was not certain of the identification but I am certain another book will be added to the naturalist’s collection. 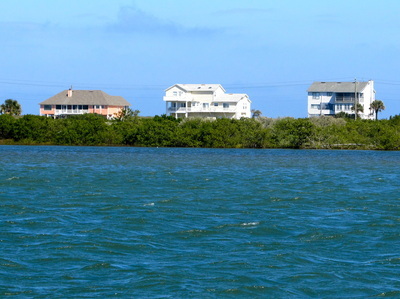 Mosquito Lagoon is bounded by the Canaveral National Seashore on the east and marsh and islands on the west. It is at least a mile wide and five miles long but the depths are low single digits and the ICW is dredged along the western edge and there was a small forest of green and red markers, like gates on a snow slalom course. The sky was clear, the north wind was a steady 10 knots with gusts that cause a 1-2 foot steep chop that occasionally brought spray over the bow. 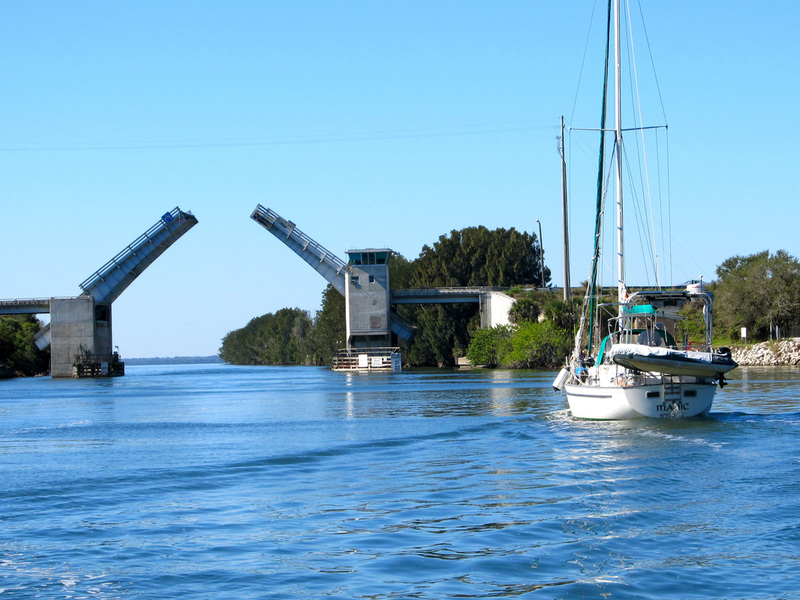 Andiamo was powered up and we zipped through this part in about 20 minutes and resumed the normal cruising speed as the manatee speed zone started. 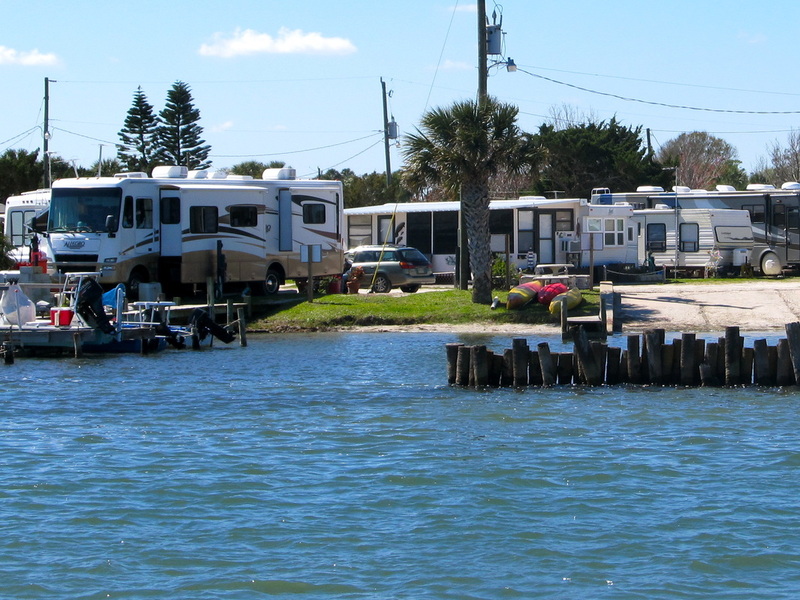 For next 10 miles, the development was a mish-mash of RV parks, mobile homes, newer homes, older homes and all with different architecture and various levels of maintenance. 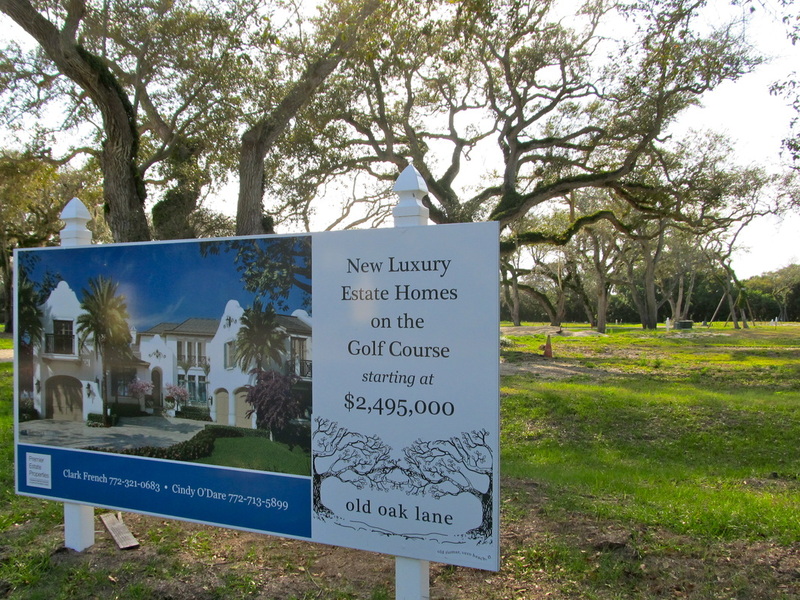 It was inconsistency at its best and volatile property values at the worst. 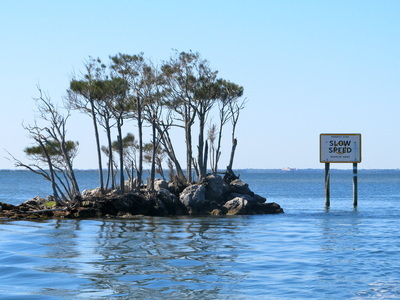 The Indian River had been our highway since Stuart and it was coming to an end. The changing current was the sign that change was happening. 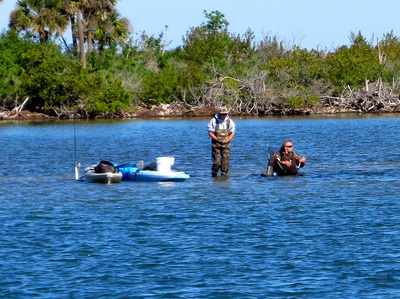 After the Mosquito Lagoon, Andiamo was fighting a current that was growing in strength. 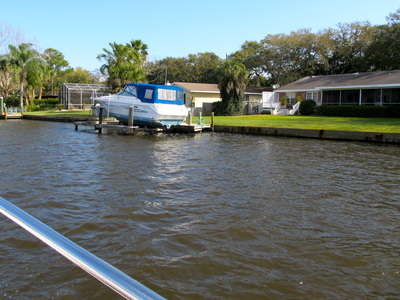 Then, after passing an inlet and a set of ripples in the water, we were “going with God” and the tug was boosted along. However, the northerly wind was in opposition to the current and this created a short and steep chop. In the battle between wind and current, at low speeds, current wins every time and Andiamo was pushed along at an additional 2 knots. At the Pounce de Leon Inlet that empties into the Atlantic, we turned to port to stay on the ICW and we lost the boost and were slogging through a 2-knot current and a 12 MPH fresh breeze on the bow. Welcome to the Halifax River where the water was smooth but the going was slower. Our first option for fuel and moorage was in Port Orange that was divided from South Daytona Beach by an invisible political boundary. The reviews on Active Captain.com showed the approach was tricky if the wind and current was up, which it was and after doing an assessment with the binoculars, we simply did not feel it, and continued on for another 3 miles to the Halifax River Marina that was in a fully protected basin. Sometimes price is not the decision criteria. We paid a few more pennies a gallon for the 93 gallons we took and a couple more quarters a foot for moorage but it just felt better and sometimes that is what matters. 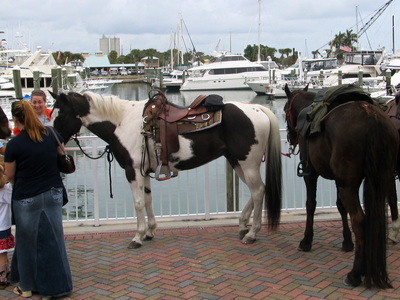 Andiamo had traveled 413 miles since getting fuel in Fort Meyers Beach 16 days ago resulting in 4.4 miles per gallon. Admittedly, it felt familiar and good to slip out of bed at sunrise and start the wonderful diesel furnace in Andiamo to take the 63-degree chill off the air. We love weather like this, cool and clear in the morning, warming to the high 60’s or low 70’s, where long sleeves and socks with sandals gives a cozy feeling. 30 years of living in the Pacific Northwest just does that to you. There was a lot to miss in Daytona Beach today with 10K races, farmers market, museums and the refurbished downtown but it was get up and go while the winds were light. 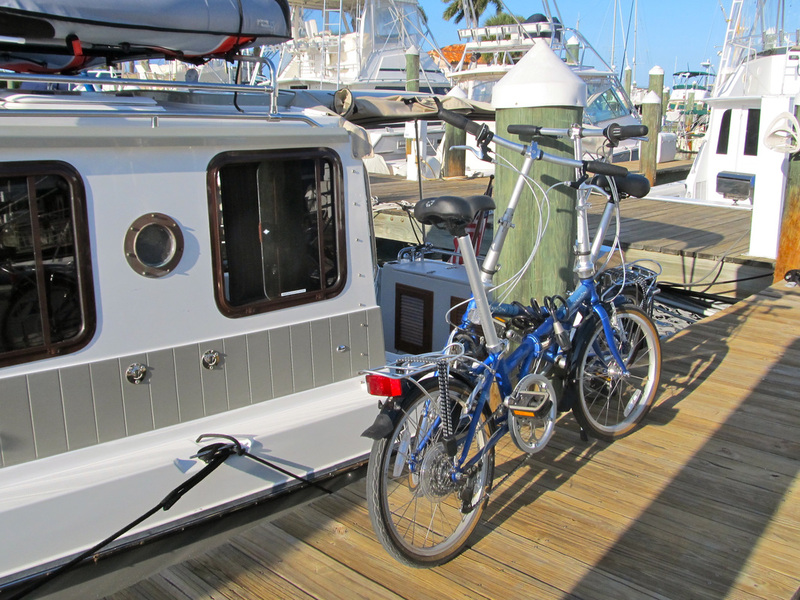 We dropped the marina key in the basket that the fuel dock employee held on a pole and Andiamo idled out the narrow marina channel. The lesson of the day: before operating the boat, do the normal morning routine of waking up because in short order, the distraction of trying to maneuver around a huge sailboat on the ICW and looking at all the activities happening on shore, twice, Andiamo was out of the channel and the shallow depth alarm sounded saying that going aground was eminent. 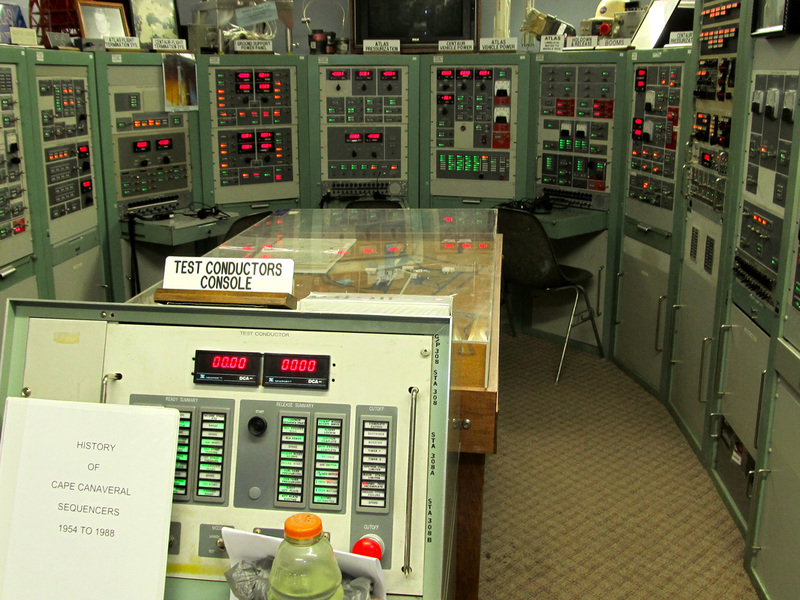 Today, we re-entered the world of currents and in a big way. For the past 4 weeks, currents and tides were not relevant. Today, we would both enjoy the benefits and fight them and all in 36 miles and 5 hours of traveling. After the four bridges of Daytona Beach, came Ormond-By-The-Sea and any name that includes “By-The-Sea” means upscale. 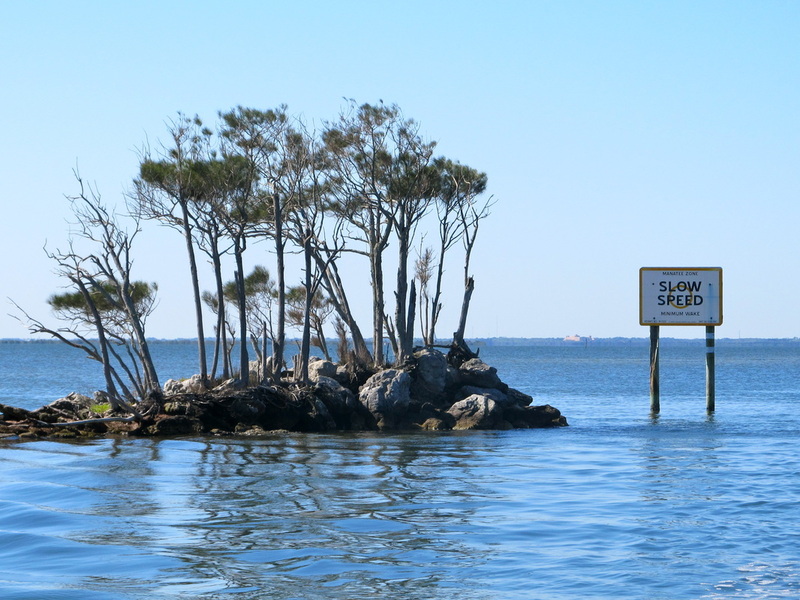 Though the Halifax River is ½ to ¾ mile wide, the channel at this part hugged the eastern shore and the speed limit was 30 MPH. Apparently, they were not successful in getting their properties designated as manatee protection zones. 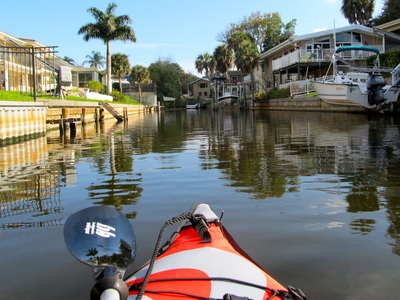 Though we were going only 9 MPH, riding the currents and sipping fuel at the same time, the distance to the docks, the manicured back yards and the huge homes was very, very close. 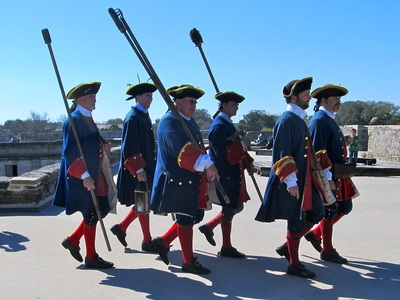 Crabpots are a frequent companion and today they were like the fog line on the roadway to mark the edge of the ICW. 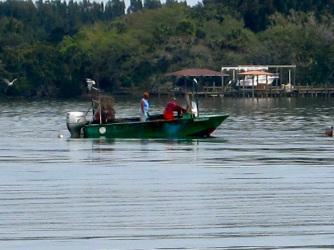 Sometimes, the crabber crossed that imaginary line and put the pots in the ICW. Several times, we had to idle down as an oncoming boat was forced toward us as they avoided pots. Then, came the community of Palm Coast, a very upscale, where every home was on a canal with the fancy fishing or ski boat that was lifted out of the water. There were miles and miles of canals that used to be swamp, that derogatory name for land that has no value to humans. These were huge homes, very nice, very nicely maintained by a small army of workers and yet no one was seen. In fact, throughout the non-urban areas, we rarely saw anyone. The houses looked closed up, the yards empty, and the docks and boats waiting for use. This was the time of beautiful weather and no bugs and where was everyone? 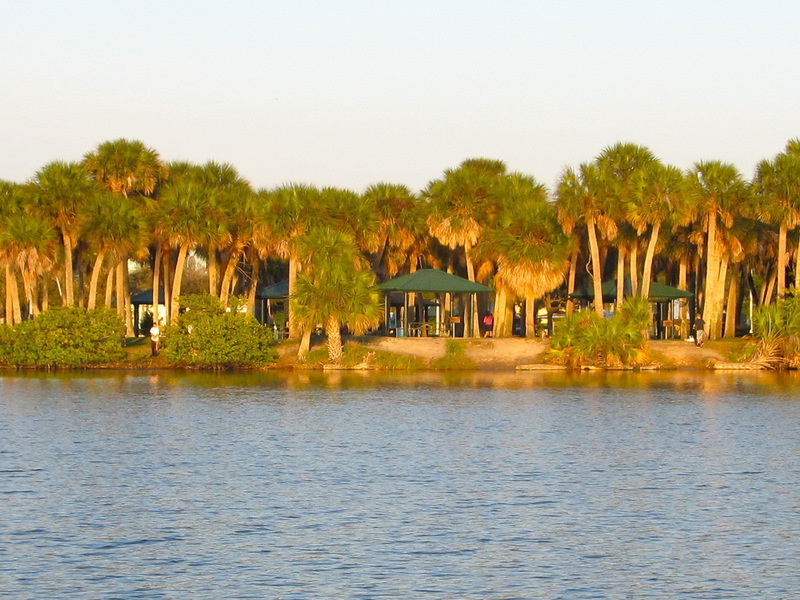 Palm Coast marked the beginning of a new brand or label as Stuart was the beginning of the Treasure Coast, Titusville was at the end of the Space Coast, and Daytona Beach was the Fun Coast. 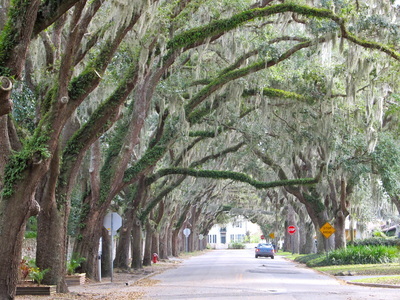 This was the Palm Coast. This community also marked the headwaters of the Matanzas River that would be our waterway. 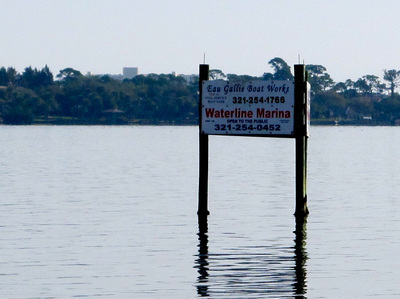 Two stark reminders of the recession were found, a billboard advertising that new mega-slips would soon be available in the spring of 2008 and an empty and stripped boatyard that once made expedition-style yachts. The current had shifted to fight Andiamo and we lost 1.5 MPH but we stayed with this as our destination of the anchorage at Fort Matanzas National Monument was only an hour away. Then, as the inlet to the Atlantic Ocean was approached and passed near the re-opened Marineland, the current shifted again and Andiiamo was flying again but the steady on-the-bow wind of 10-14 MPH made a short and steep chop that occasionally spray over the bow. Following the approach as described on Active Captain.com, we rounded Rattlesnake Island, and approached the National Park Service dock on the north shore. Here the wind and current were both going south. In 10 feet of water and 100 yards from shore, Andiamo was pointed into the wind and 60 feet of anchor and rode was dropped. The Ultra anchor grabbed immediately and our southward slide on a 1.5-knot current that was assisted by a 10-14 MPH wind was stopped. The remnants of the civil war fort were on Rattlesnake Island. 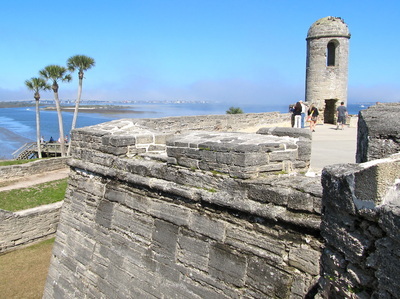 This park also has a history connected to St. Augustine when French soldiers were killed here, thus, the Spanish word for slaughter is matanzas. We evaluated the conditions of taking the kayaks out in a current that was equivalent to our Snohomish River on an ebb tide and decided that getting to shore would be tricky but do-able but getting back against both wind and current would be a challenge. Instead, we took a nap and just hunkered down. Two hours later, the current had switched 180 degrees as the flood tide came raging in. The current was strong enough to spin the prop with the transmission in neutral. By dinner, that current was at least 3 knots and it was impressive as was the sunset over the ruins. Cruising is about following what calls you but also staying flexible as adaptation is necessary to changing conditions. What started as a two day stop would change. The morning brought a light sky and a blanket of fog so thick that the shore 300 feet away was only a vague outline. Every six hours, the current had shifted 180 degrees and the intensity would build to at least 3 knots, then fade, go slack, switch directions and the cycle would start again. As we waited after breakfast for the fog to lift, I wondered how difficult the task to free the Ultra anchor from the bottom would be. At 10:30 AM, the curtain of mist lifted and blew away in a gust of fresh breeze. The anchor was reluctant to come up and the building current that pushed on Andiamo, driving the anchor down, did not help. 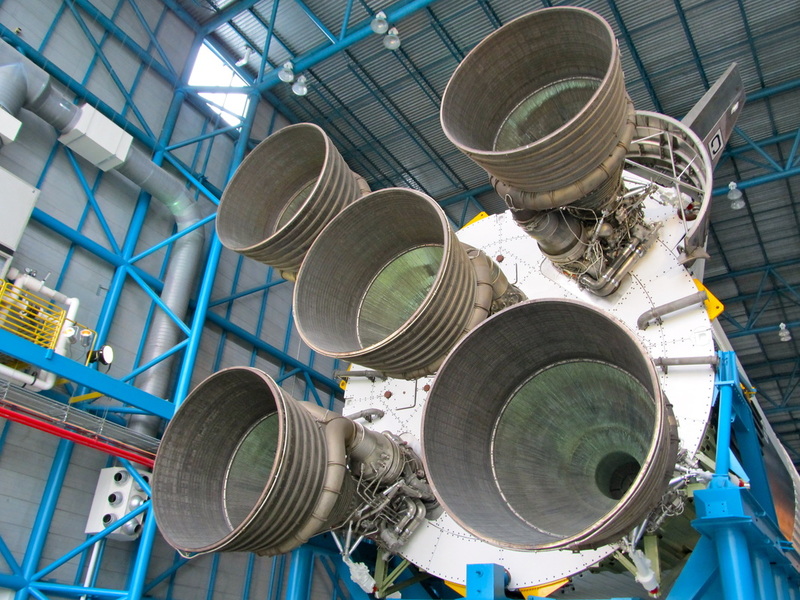 But, using the engine to push on the tight rode, keeping a steady tension on the chain, and being patient while the laws of physics did their magic, resulted in a clean extraction. Like the day before, the currents would slow us and help us. 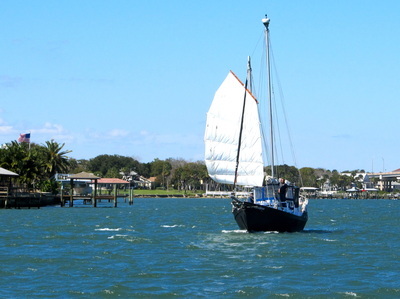 St. Augustine was 15 miles north and the ebbing Matanzas River slowed us at first then at the Crescent Beach Bridge, Andiamo was released from the current’s grip and over the next two miles she was propelled faster and faster. As the river widened to a large delta, Andiamo was going 10 MPH at an 8 MPH engine speed. 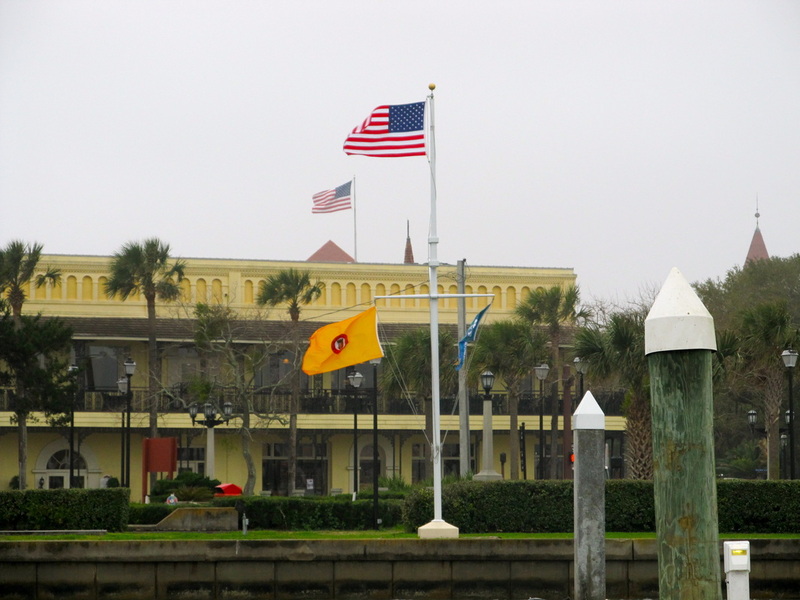 We arrived at the St. Augustine Municipal Marina in 2 ½ hours. 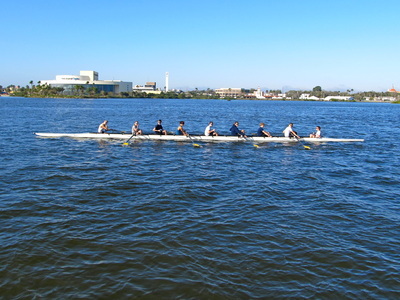 River and tidal current and wind can make this docking tricky but we looked like pros. The notion is to go slow and use only the amount of engine power that is needed. The marina was only ¼ full. We paid for two nights, and after lunch we walked to the nearby National Park Service area, Castille De San Marcos National Monument where we spent the remainder of the afternoon. This Spanish fort illustrated the complexities of the 450 years of history of exploration, conquest, battles, changes of power and culture and survival. The Park Service does the best job of the interpretation of history and science and we always enjoy it. 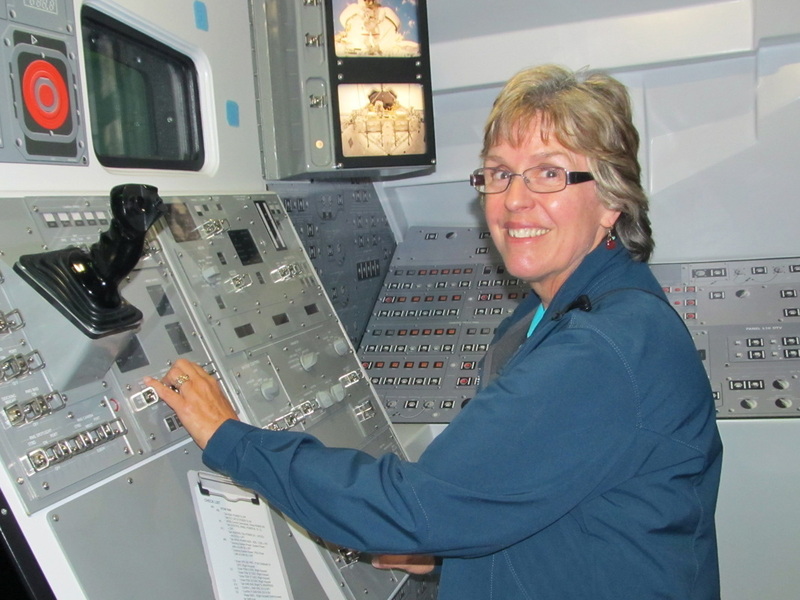 The next day, Laurie called a “Captain’s Planning Meeting” after breakfast and over coffee. 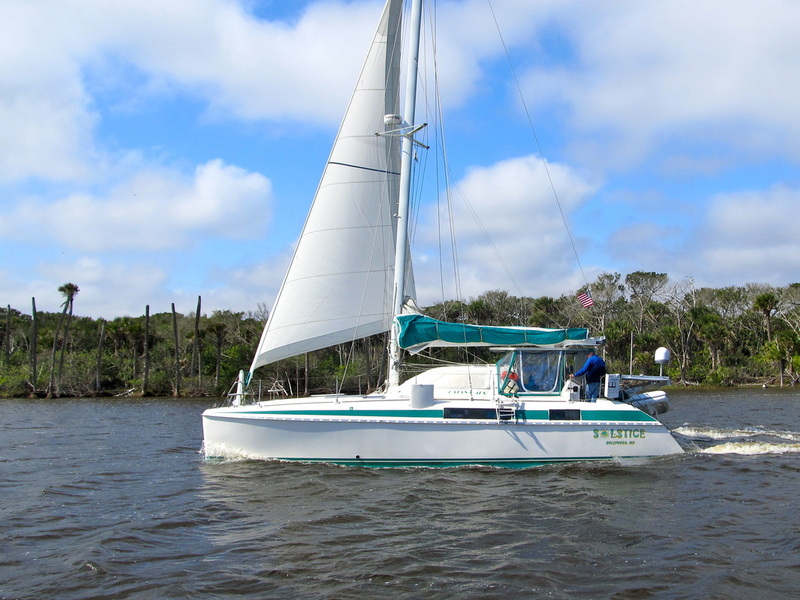 After digesting the anchorage and marina options for Jacksonville, a careful review of the wind and rain forecasts in both Jacksonville and St. Augustine for the next 5 days, and what the currents are doing, we had to adjust the plans. With the weather turning, it was time to provision. The marina crew came up and pumped out the holding tank as part of the dockage. The employee told us about a very scenic neighborhood that was down river from us. The bikes were unfolded, loaded with bags and a milk grate and we rode the nearly two miles to the Winn-Dixie store on Ponce-de-Leon Blvd where food for at least a week was bought. Laurie stripped out a lot of the packaging in the parking lot and we were back at Andiamo by noon. 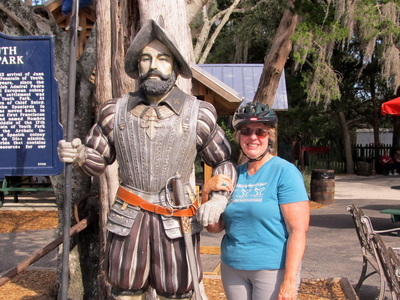 After a late lunch, the bikes took us north to older, yet scenic neighborhoods with cobblestones,, to a sanctuary operated by the Catholic Church, past the Florida School for the Blind and Deaf where Ray Charles was schooled, to the Ponce-de-Leon Fountain of Youth, several tourist traps, the Flagler College, the civic center, Trinity Episcopal Church, and the Florida National Guard Headquarters and national cemetery. We had a great afternoon seeing the historic part of St. Augustine up close and personal and yet quickly without the hassle of parking. The blue sky was gone and it would stay that way for a few days. The steady wind from the north continued to create a 1-3 foot chop that caused the smaller sailboats and the catamarans in the mooring field to the north us to leave and find calmer conditions. The city operated mooring field to the south seemed to be better protected but was farther away from the dingy dock which was evident in the faces of the dogs coming to shore in their master’s dingy that their bladder was really hurting. Another look at the weather prediction models on Weatherbug and Sailflow showed that Wednesday and Thursday were not a travel days. 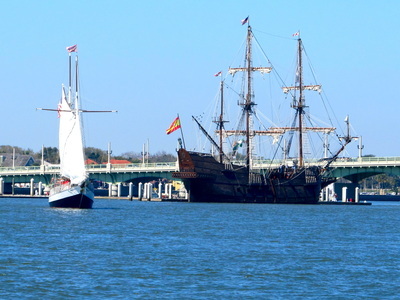 Friday looked like the beginning of the travel opportunity to go to the St. John’s River, and Jacksonville. Looking outside of Andiamo’s windows, it looked like Seattle, not 3,200 miles to the southeast. We had lunch with Robin and Jan who are parents of our nephew’s girlfriend. 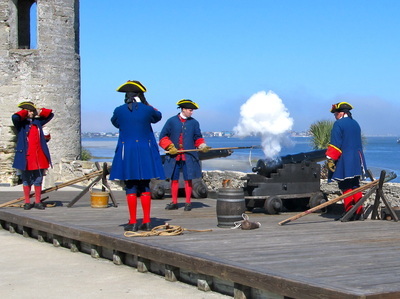 They live in St. Augustine after moving from Connecticut. We shared family stories and personal history and we had a great lunch at a restaurant they chose in the historic district was easy walking distance. 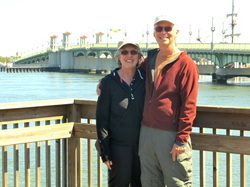 After saying our good-byes to them, Laurie and I split up to walk and explored the ways that called us. We spent the evening catching up on the electronic communication and Laurie was thoroughly digesting all the information on the St. John’s River. The next day, we paid for another two nights of moorage and asked about the weekly rate thinking that we are at that break even point but their weekly rate is essentially buy 6 nights and get the 7th night for free. The heavy cloud cover would last all day and the high temperature would the same that is in Seattle, but no rain. Like yesterday, it was the wind that was keeping us in port with a steady 12-15 and gusts in the 20’s MPH. In Puget Sound, this would not be a big deal and we frequently boat in these conditions, taking some spray over the cabin and riding the 1-3 foot chop. What makes it different here is the depth and the narrow channels where there is little room to be blown around. The chop is steeper and tighter together. Also, we do not have to go out and take an unnecessary risk because there is no schedule. I followed Laurie’s lead on doing museums. We started with the Lightner Museum that was about a 10-minute walk from Andiamo. The building’s original purpose was a hotel for the wealthy who came to winter in St. Augustine starting in the late 1890’s. 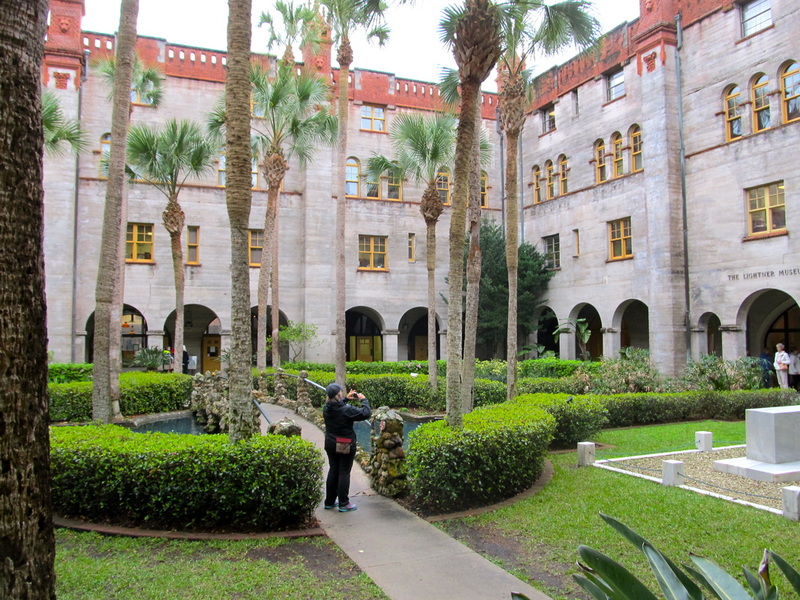 Today, this grand, multi-story complex with its outdoor square in the middle that is complete with a fountain houses a restaurant, the St. Augustine City Hall, a variety of Florida state departments, a smattering of retail and services and the Lightner Museum. 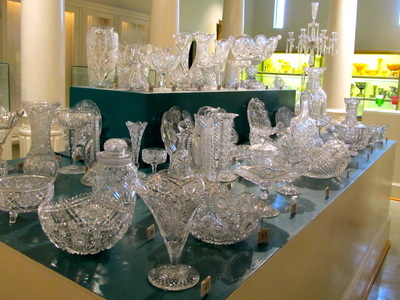 We spent nearly two hours browsing the collection of art, scientific artifacts, and antiques that the wealthy collected. 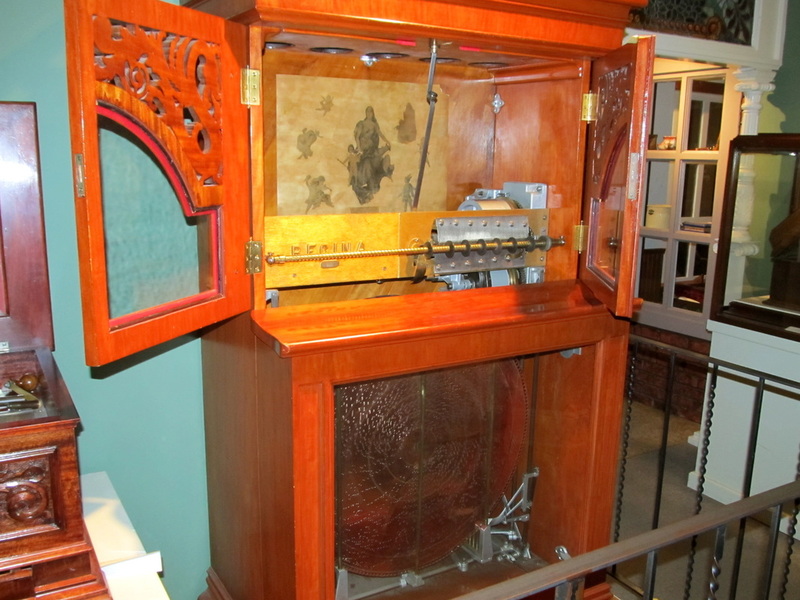 The serendipity was the demonstration of devices from the 1890’s to the 1920’s that played music from player pianos that used paper rolls punched with holes, to a mechanical violin that played according to holes punched in metal, to a crank powered, small organ that played according to the holes on a cone. 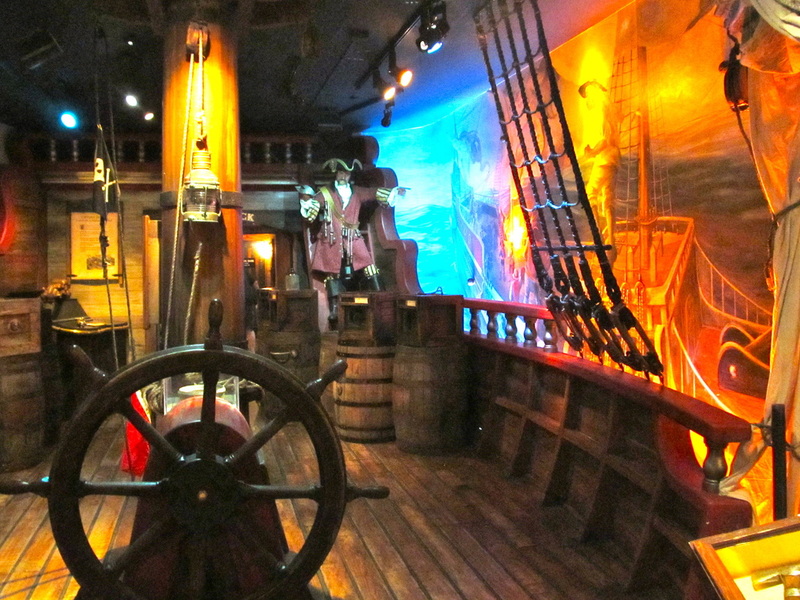 After lunch at a Mexican restaurant that was recommended for its Sangria, we spent another two hours at The Pirate Museum as it was highly recommended by tripadvisor.com. We do a lot of museums and this one was well done. Highly compact in a limited floor space, it was a blend of information, highly interactive, and used a variety of media from computer, to audio, artifacts under glass, and great storytelling. Now, the difference between government approved privateering (attack the enemy and keep what you find as payment) and pirates is under better understood, that the most effective captains used participative leadership style, and Sir Frances Drake was not only an explorer, but was one of the most effective pirate captains. After a very light dinner, the 7PM Ash Wednesday service at Trinity Episcopal Church was attended and it was nice to be with over a 100 local people at a service that was very familiar to us. Another day of solid clouds and a steady 15+ wind from the north that brought chop and white caps. The regional weather prediction included thunderstorms and tornado warnings. Andiamo’s lines were re-assessed and an additional spring line was added to handle more stress from the north. By mid-morning the rain started and continued for several hours to fully stop by mid-afternoon. 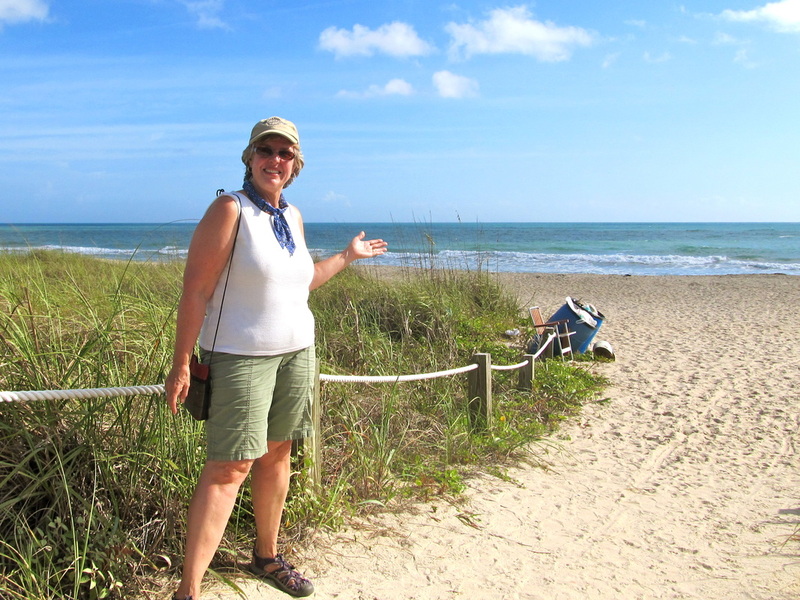 Between showers, Laurie made runs to the marina’s washer and dryer and we did a couple walks to stretch our legs. Two movies from the Bourne trilogy were watched with a light dinner at the A1A tavern sandwiched between them. Found this on the side of the highway while biking. Slowing down and you find more opportunities to see the unique. State parks are owned by all the people and were created to preserve the unique wonder of the park for generations for come. Laurie and i both worked for the National Park Service. This sign is the illustration of how far things have gone bad. The parked is fenced, posted, guarded, and gated for the purpose of collecting fees. 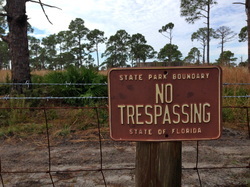 State Park - No Trespassing. Wow. 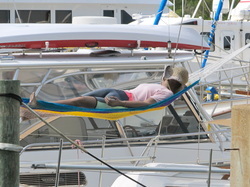 It took us nearly two days to determine that this a manikin and not a person lounging on the foredeck of a sailboat. This homeowner has wishful thinking. 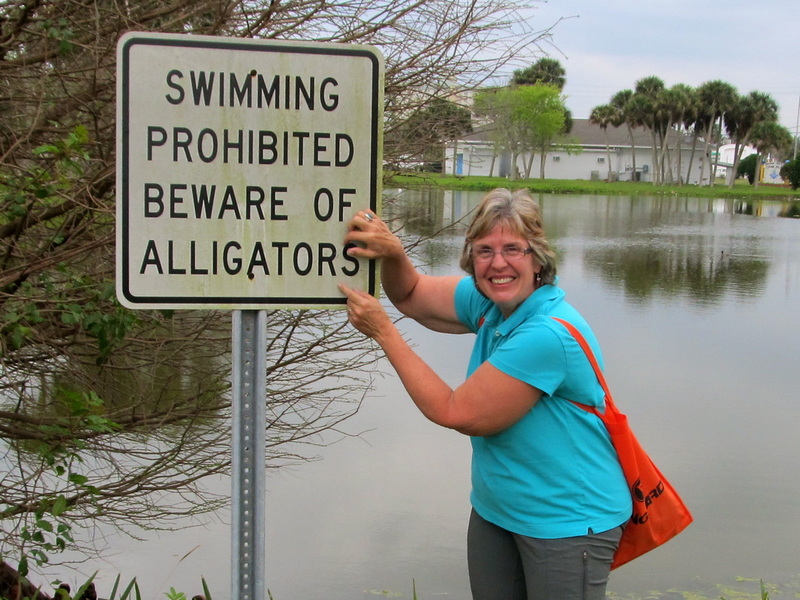 If the signs are not authorized and put up the State of Florida, they do not count. 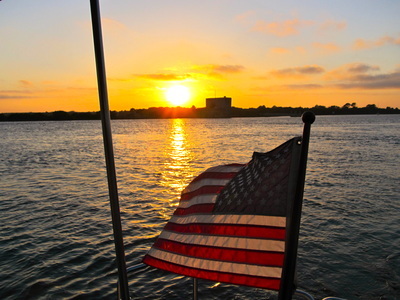 There may be civil penalties but when craft are flying down the channel, legally at 30 MPH, good luck on determining the boat and you can forget about identifying the skipper. This is about expectations. 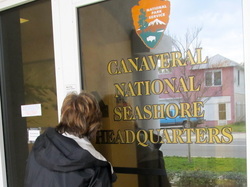 When the National Park Service has a prominent presence in downtown, this creates the expectation that the public can receive information. The sign says they are open, the locked door says they are not. The agency has the value of being accessible, but the small sign that say, "Press the bell for service" sends a different message. In the above photos, these decision makers have a sense of humor or are engineers who want exact, not something vague or general, behavior. 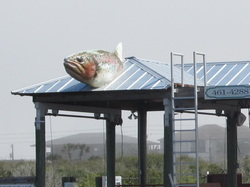 This was found on a "dock and dine" restaurant and the size of the fish is a real head-turner.